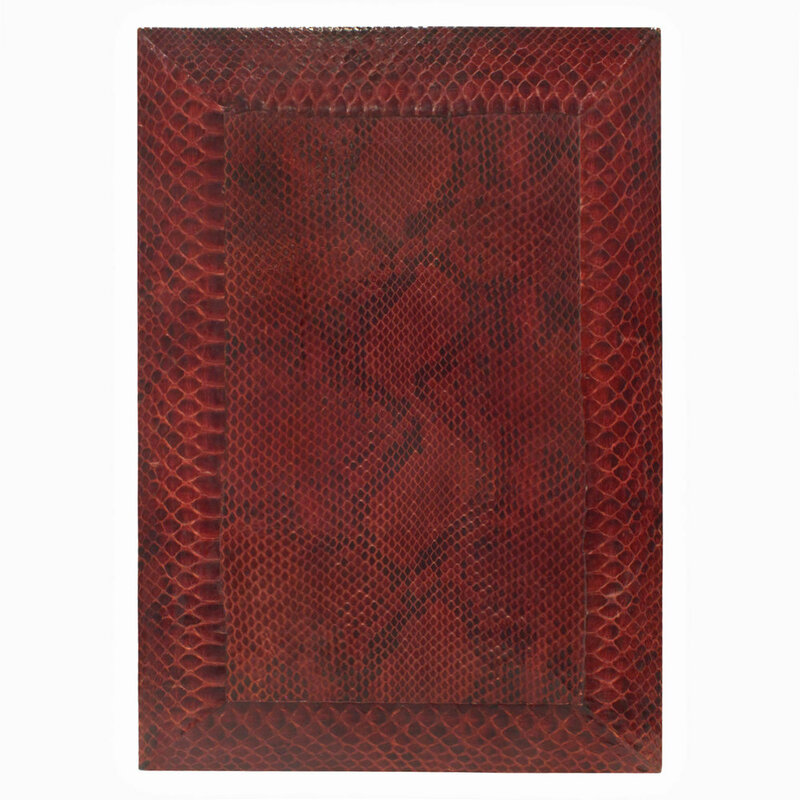 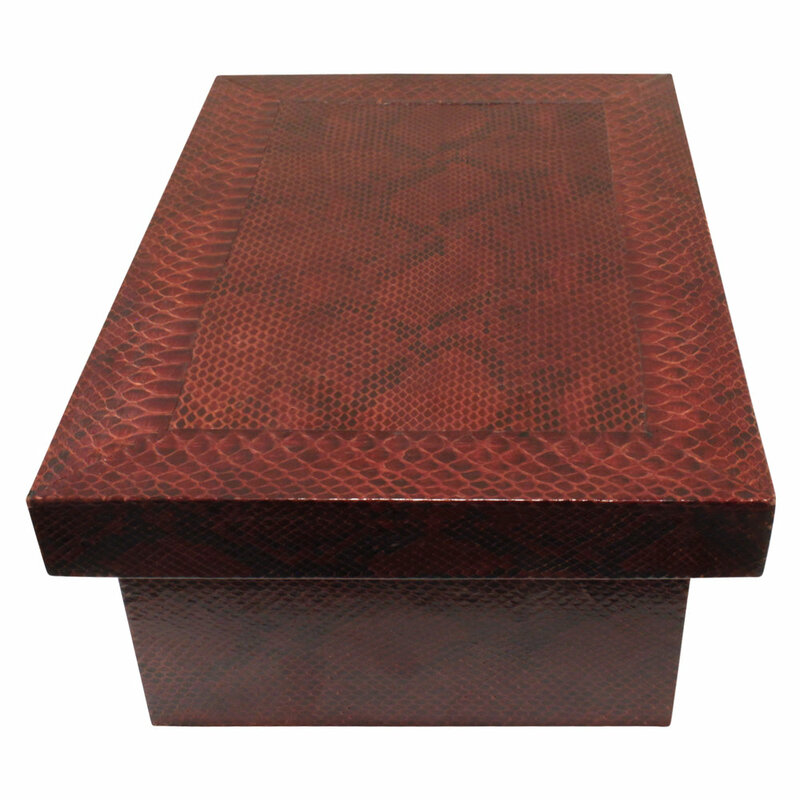 Lidded box covered in burgundy python by Karl Springer, American 1980's. 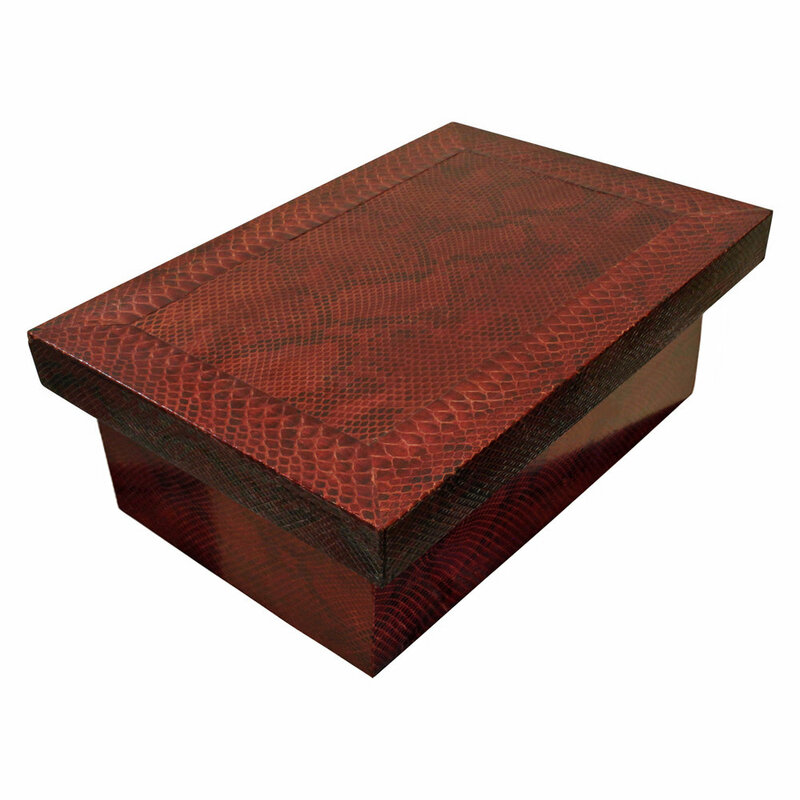 Interior and bottom covered in burgundy leather. 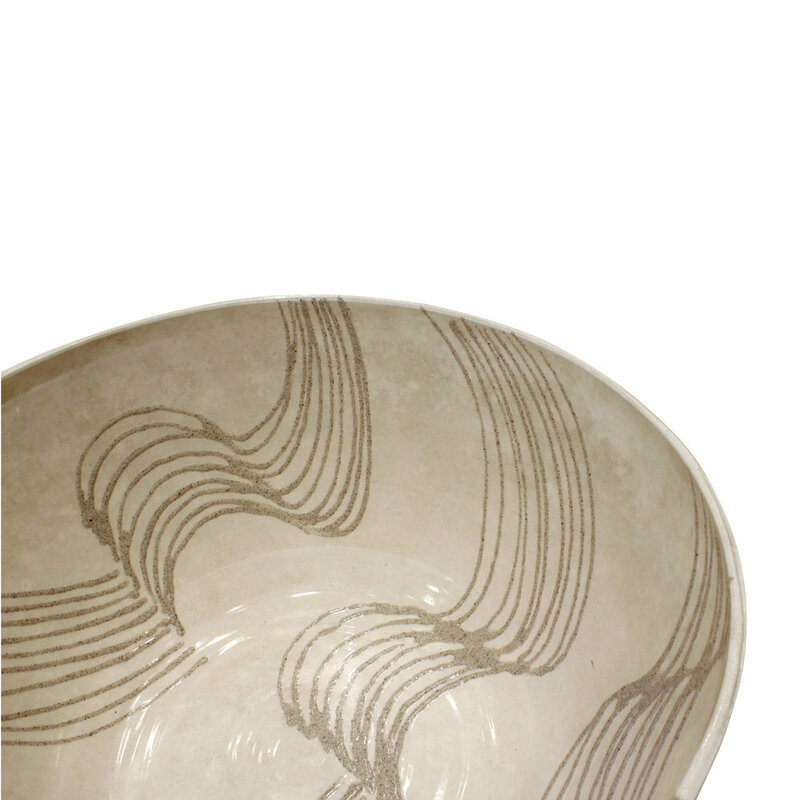 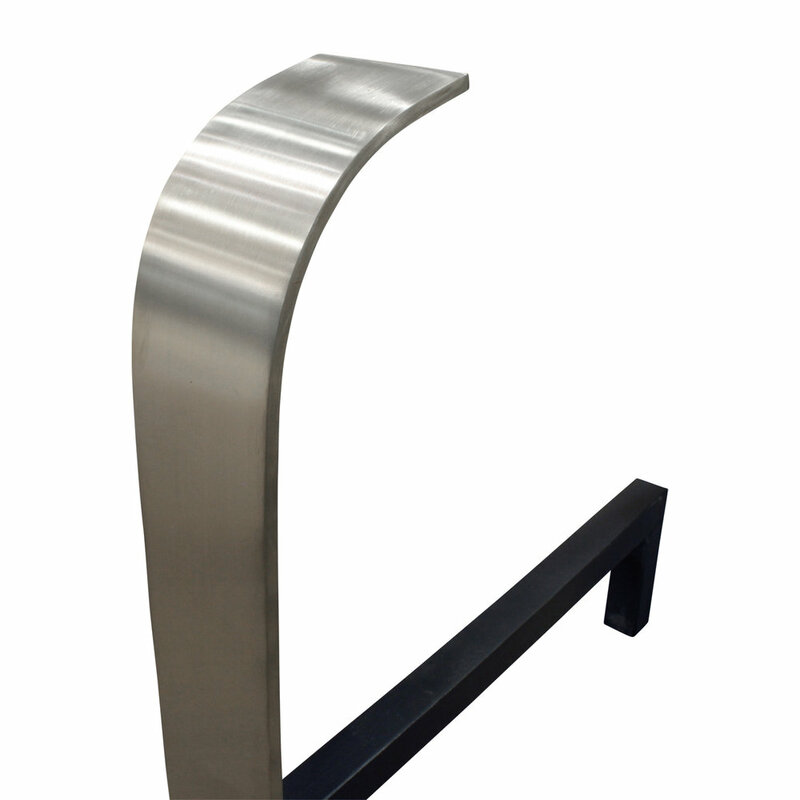 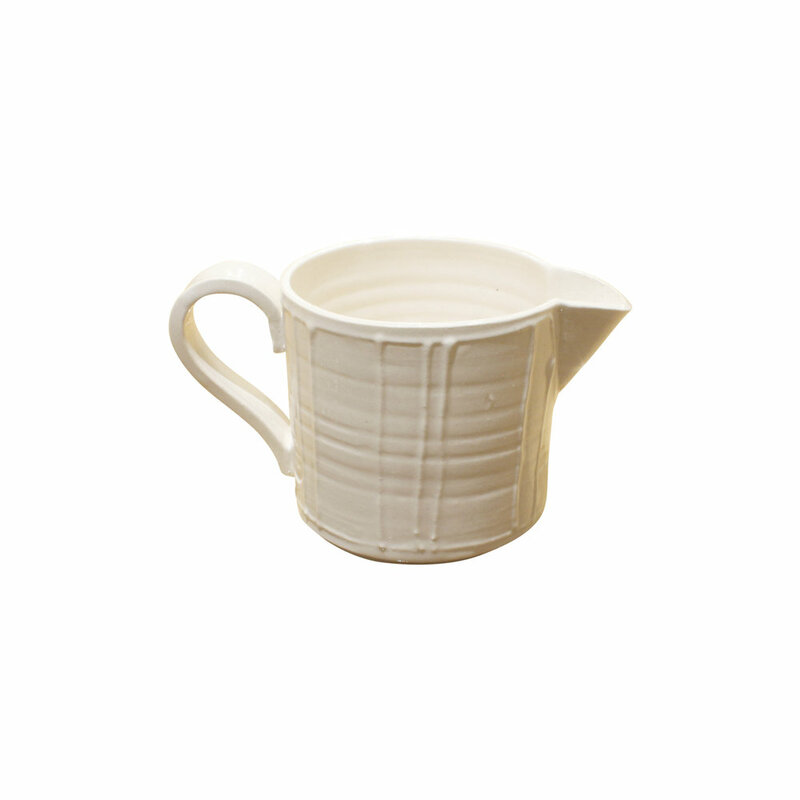 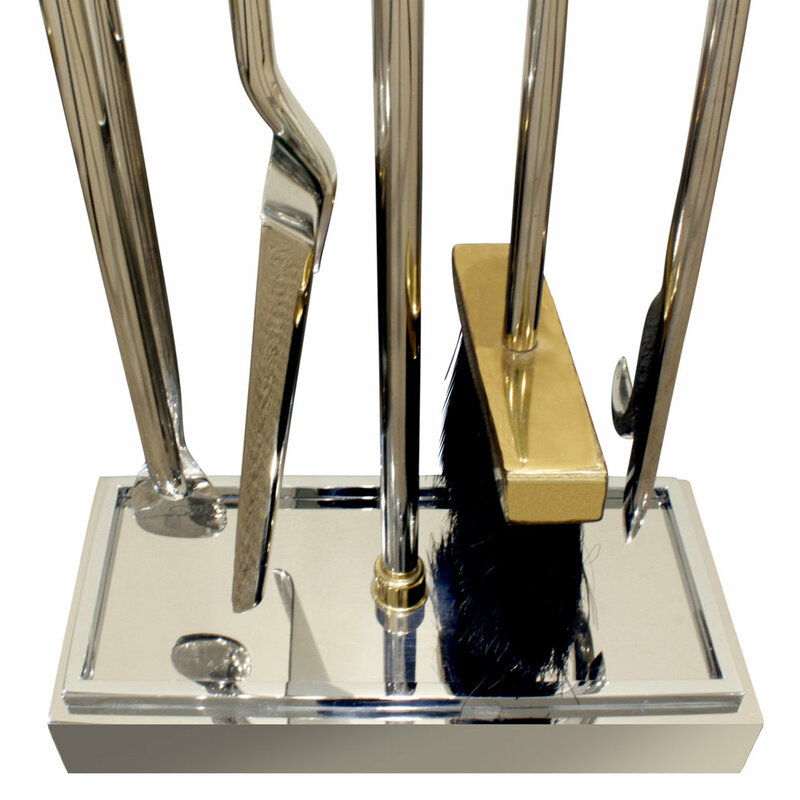 Springer’s pieces are meticulously crafted. 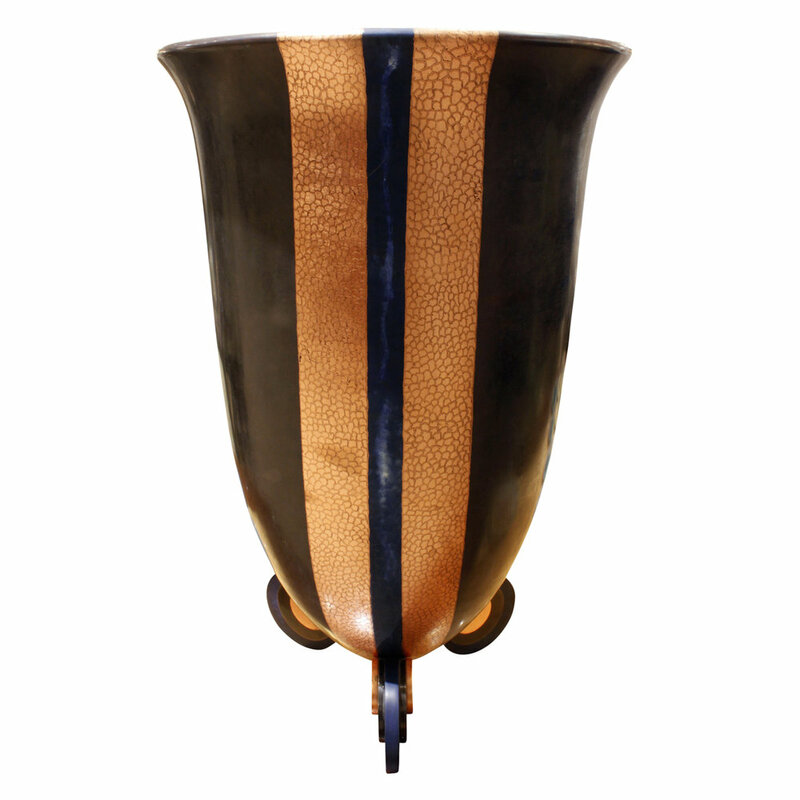 Large hand blown amber glass vase with scavo finish by Seguso, Murano Italy, for Karl Springer, American 1980's. 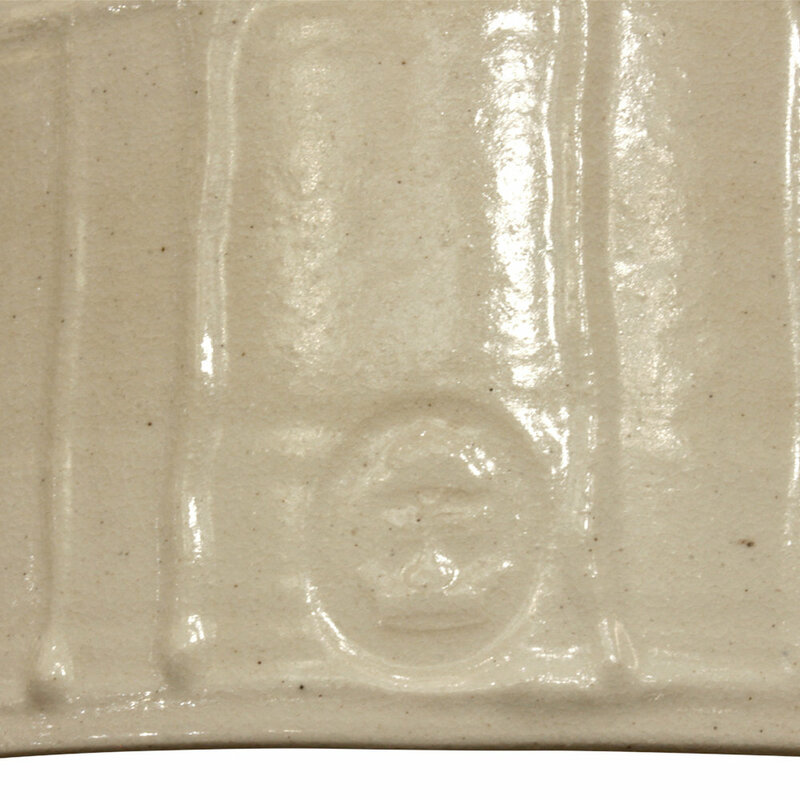 Signed on bottom “Karl Springer”. 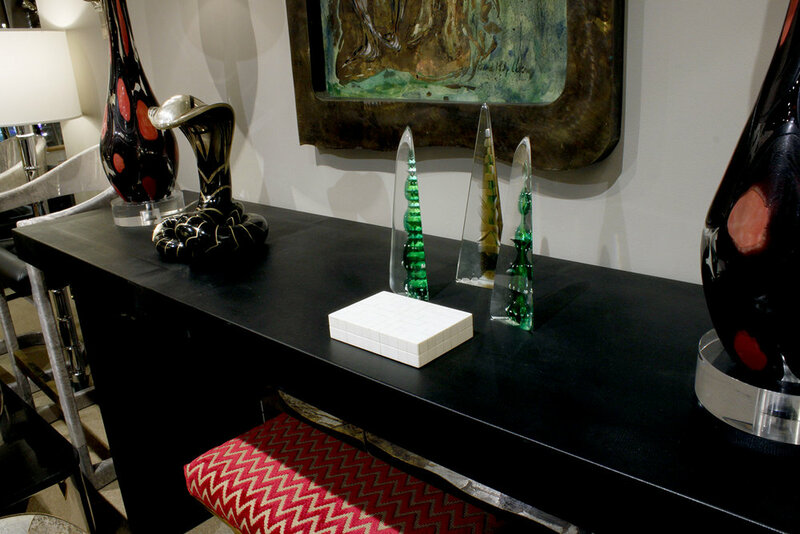 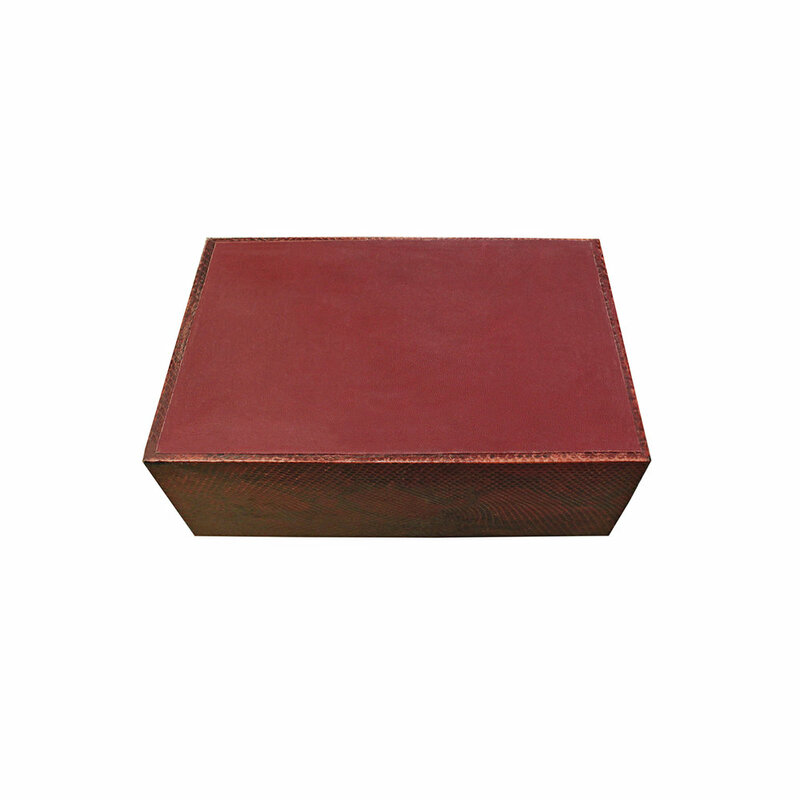 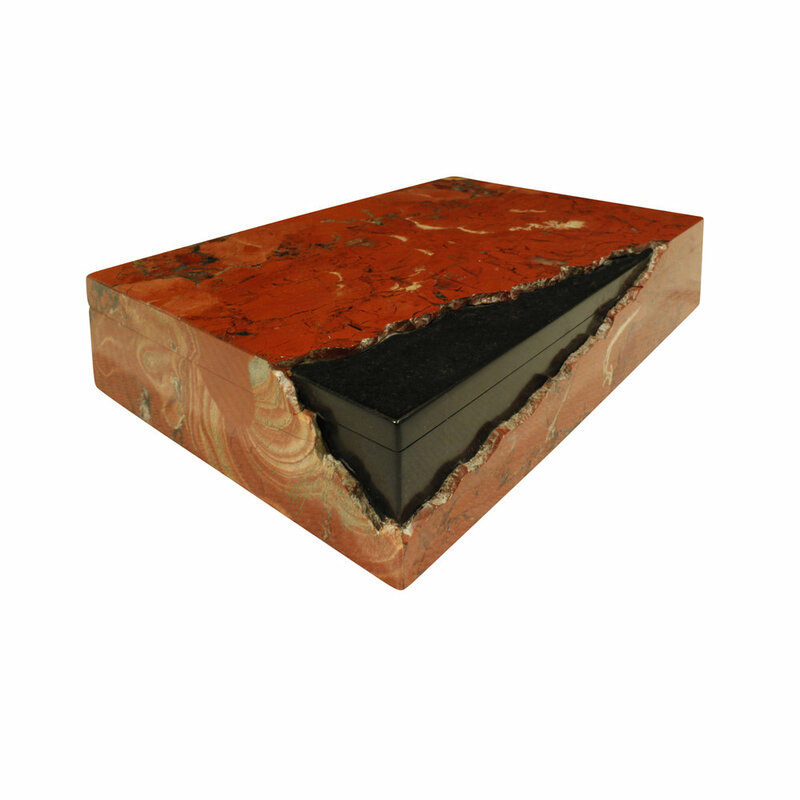 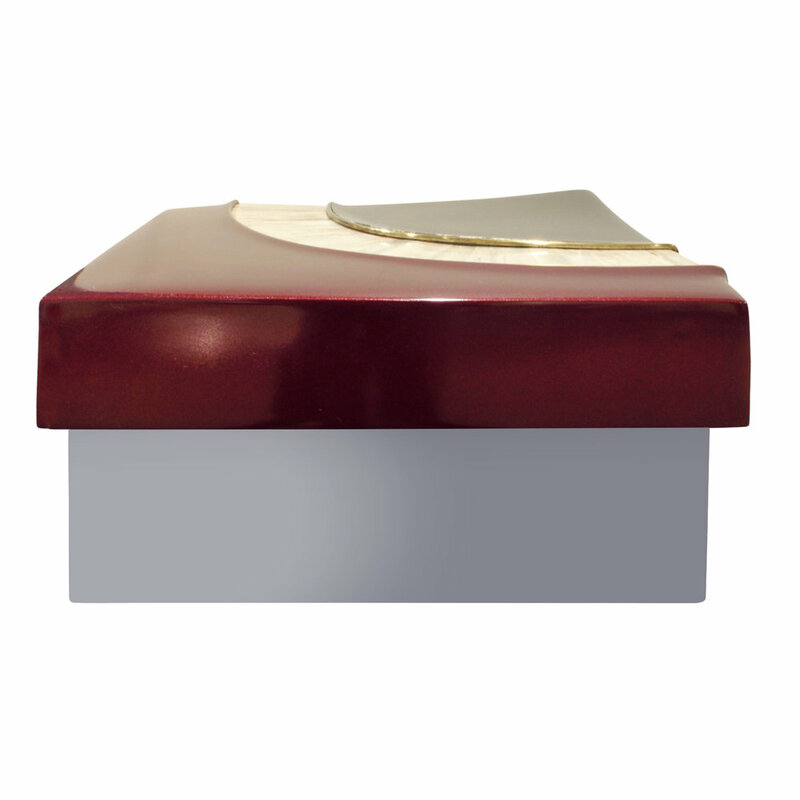 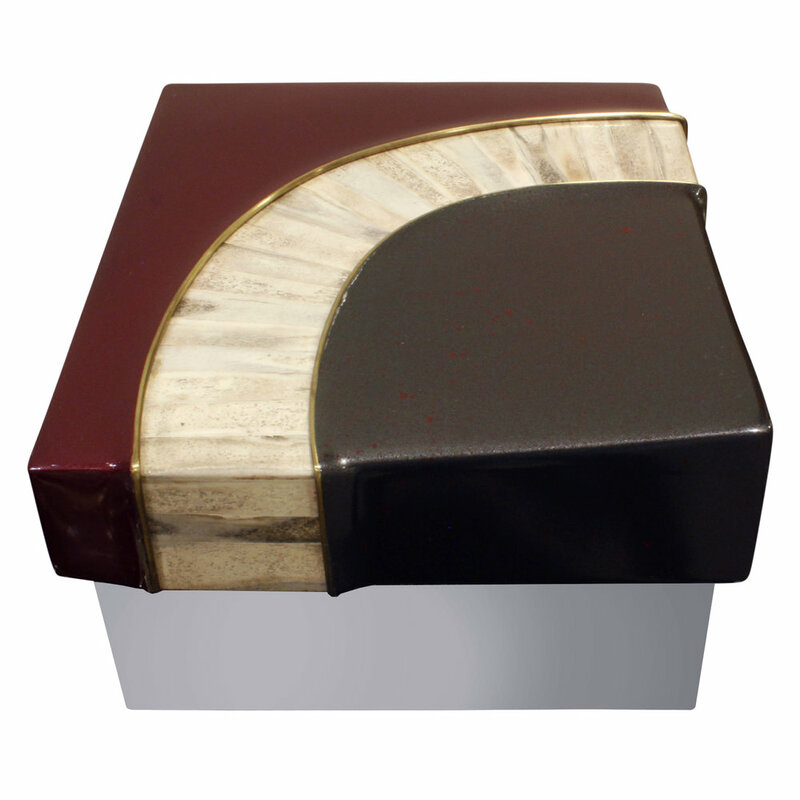 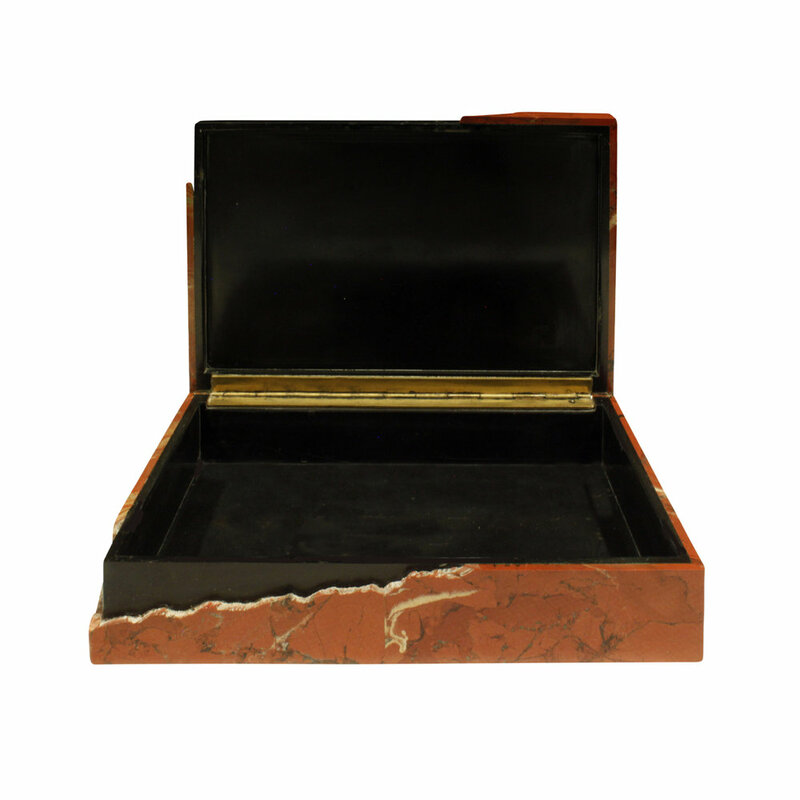 Exceptional box with sculpted cover in red and black glazierite with bone and brass accents, base in stainless steel and interior in burgundy suede by Johnson and Marcius for Karl Springer, 1980’s. 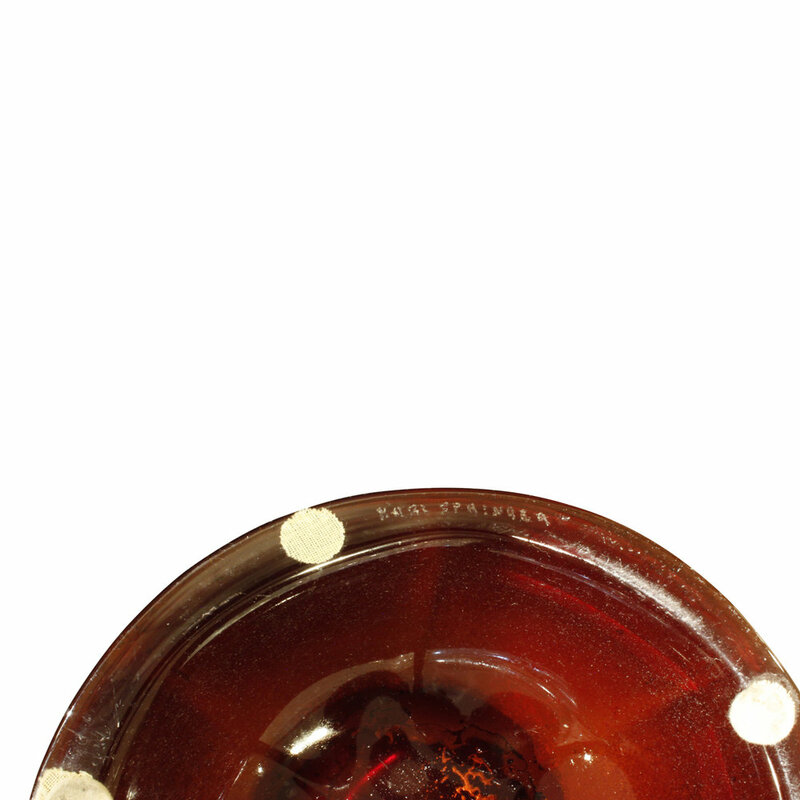 Glazierite was a material unique to Karl Springer. 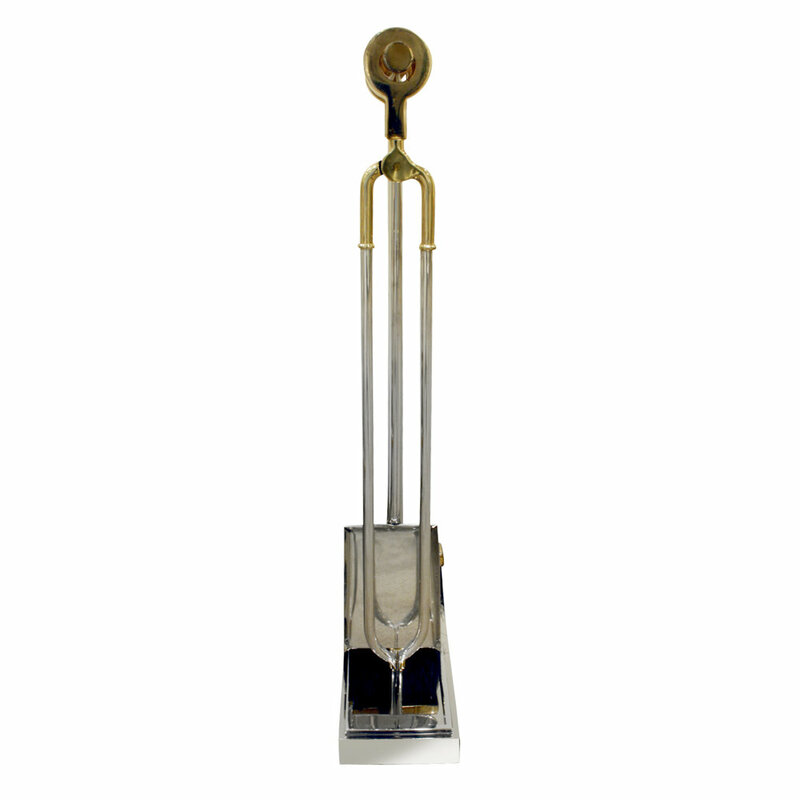 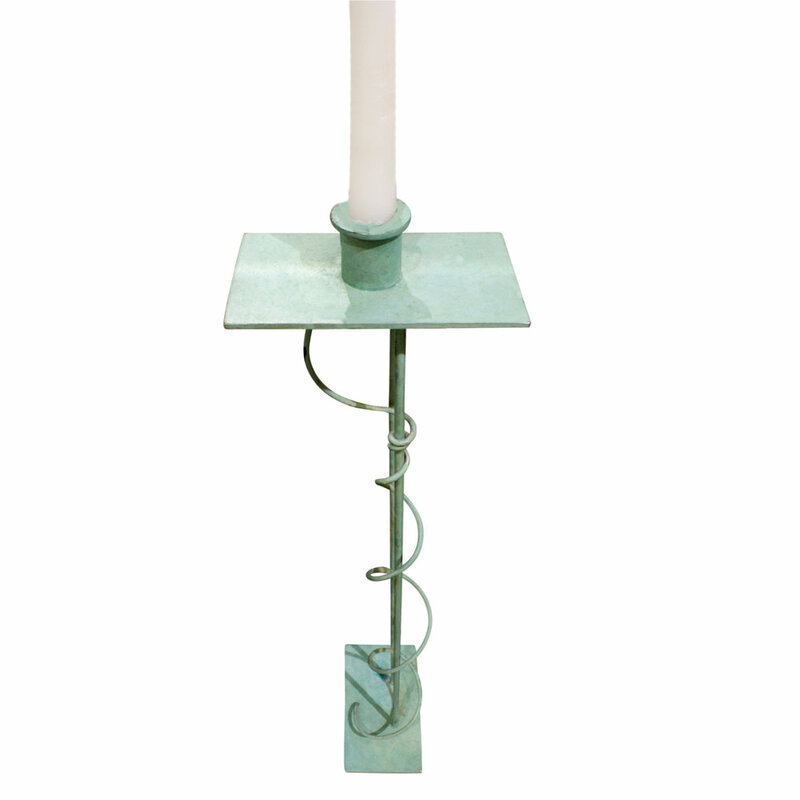 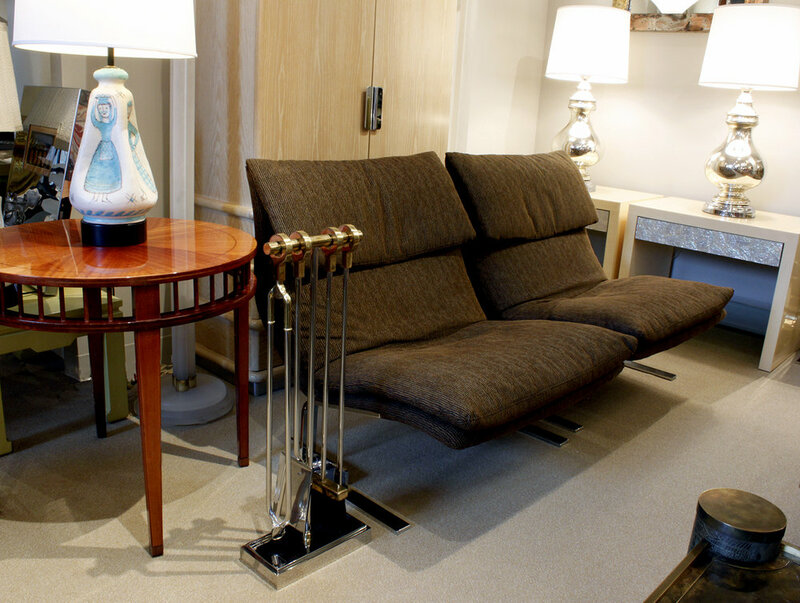 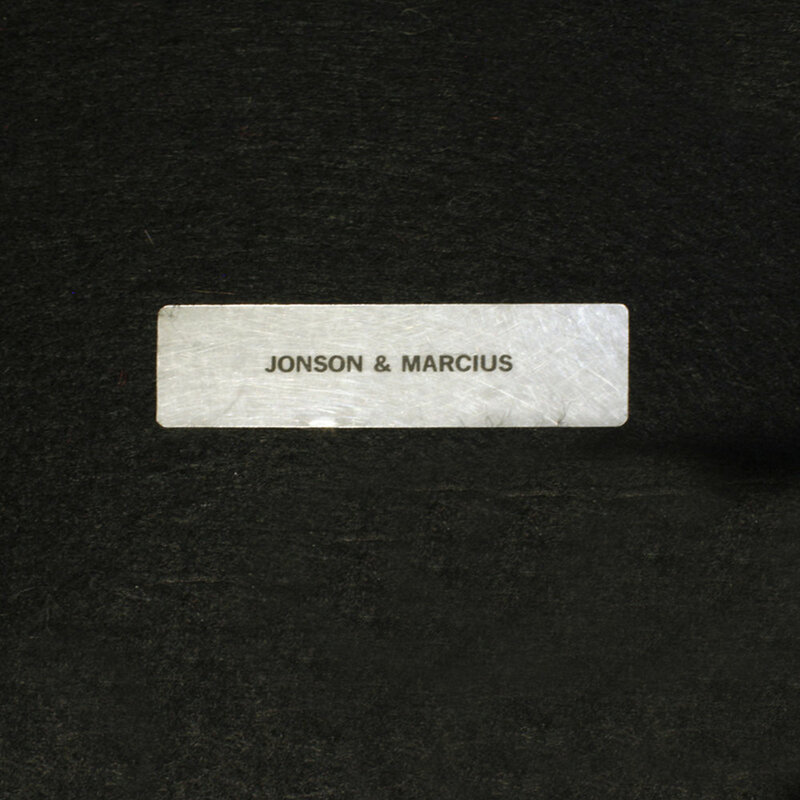 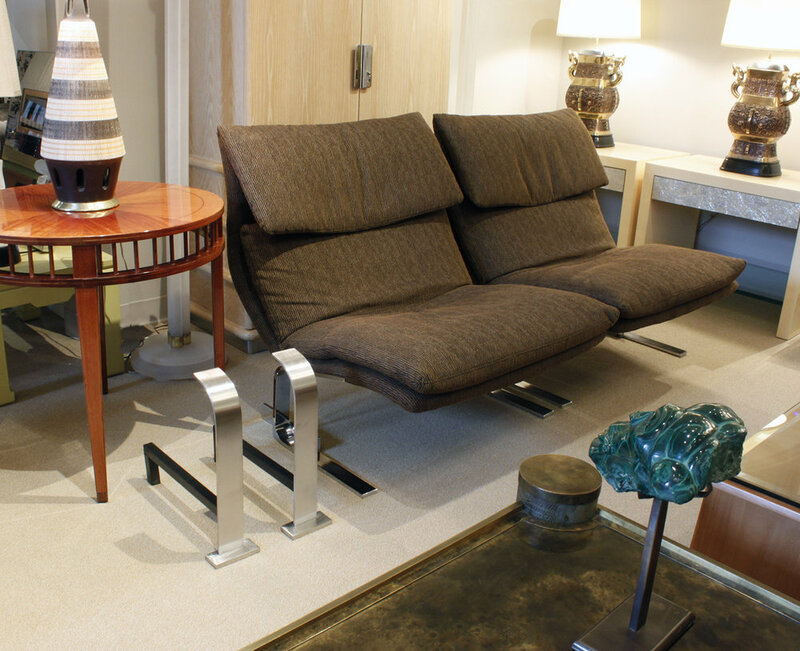 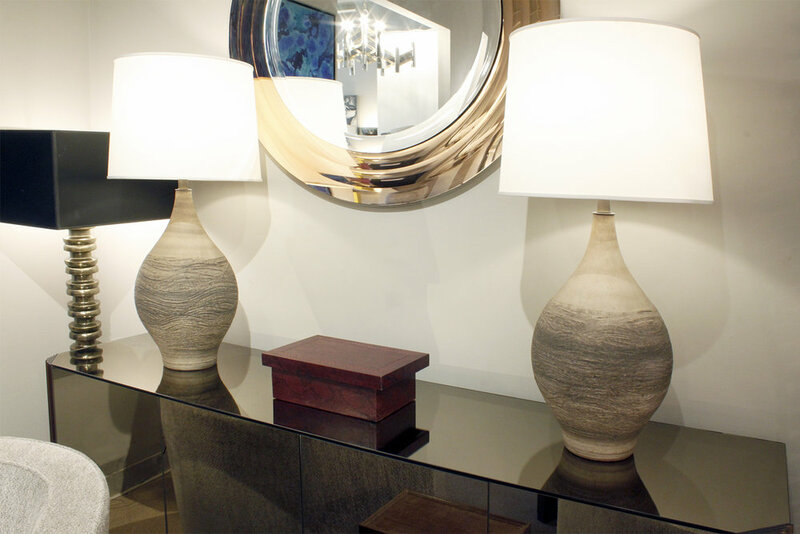 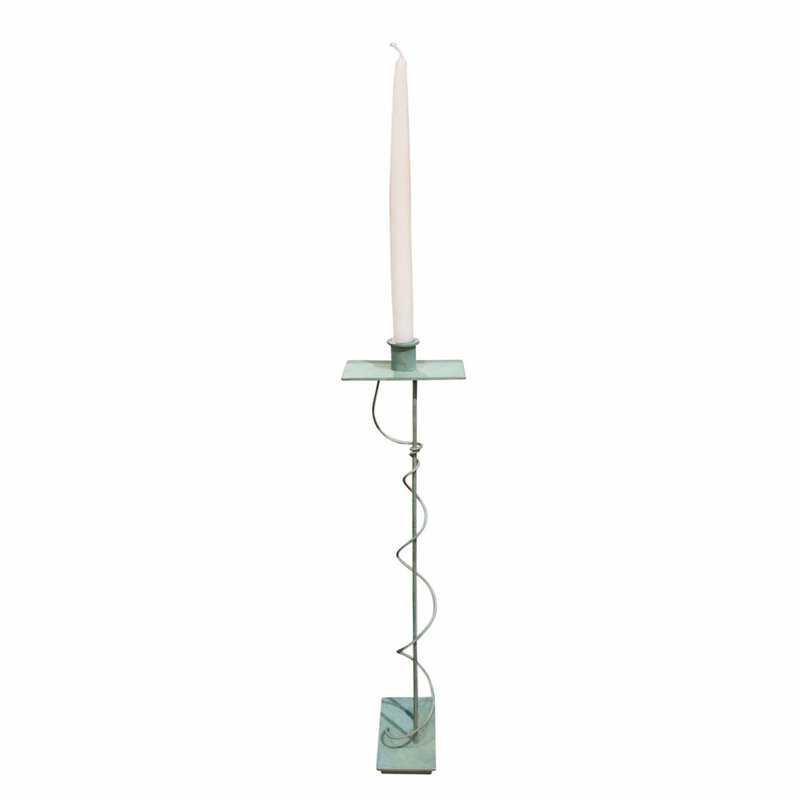 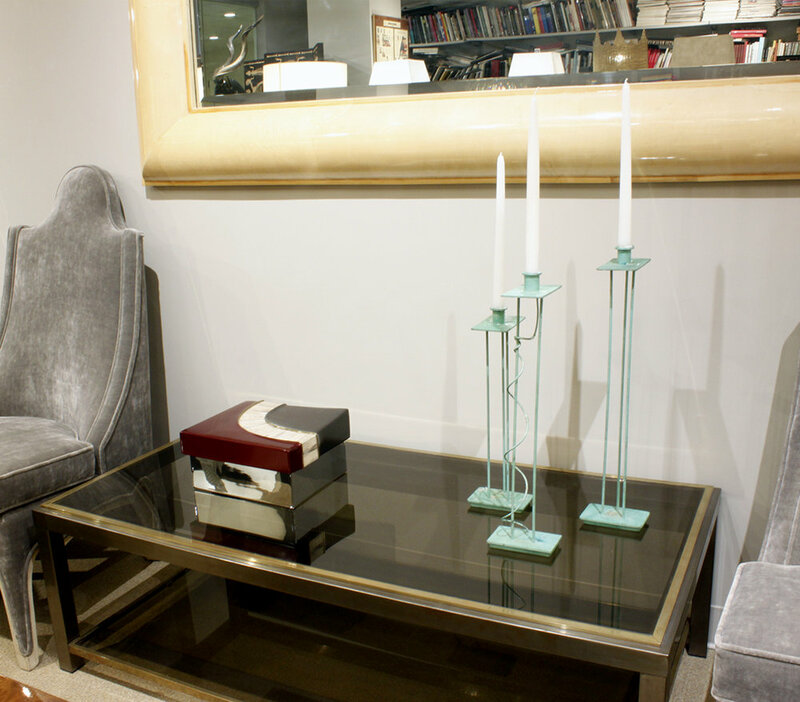 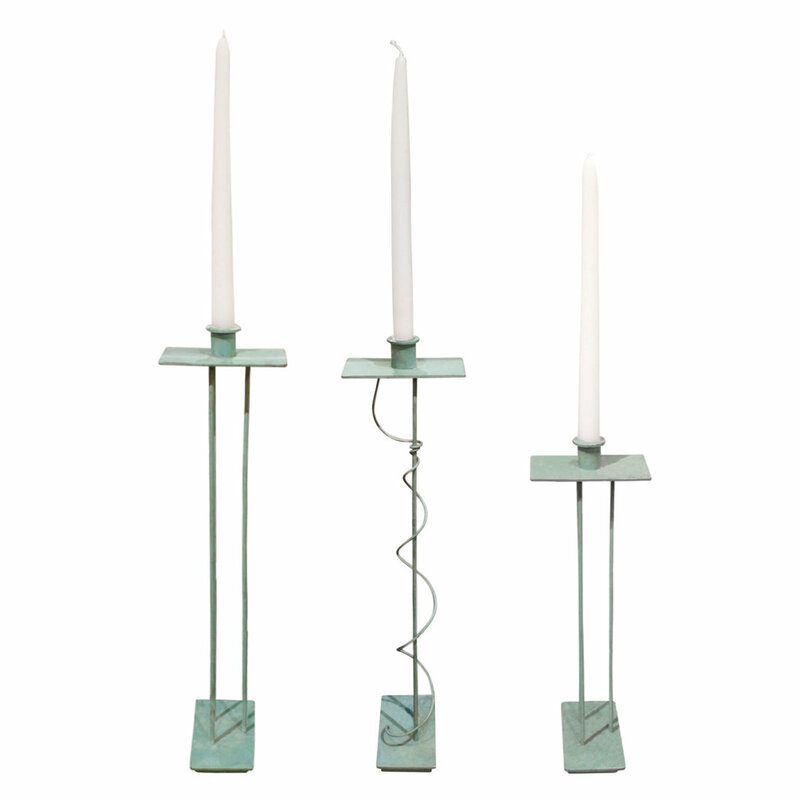 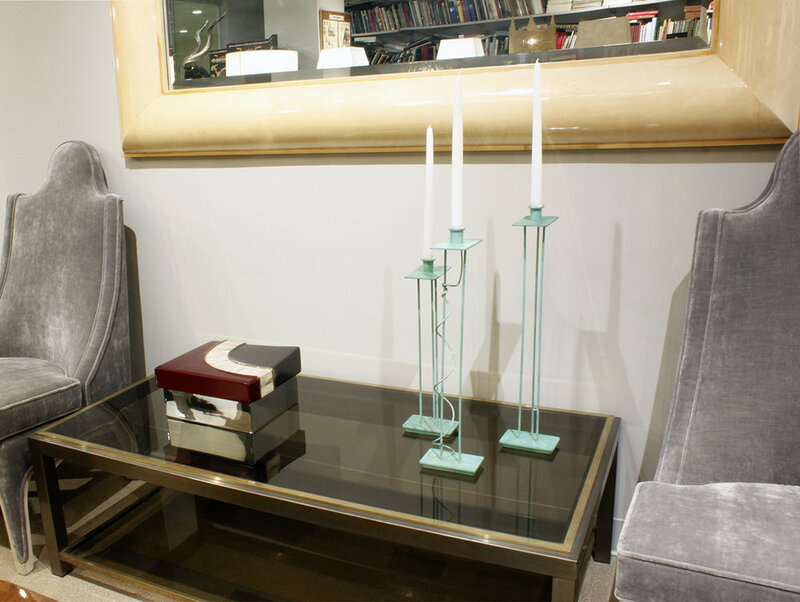 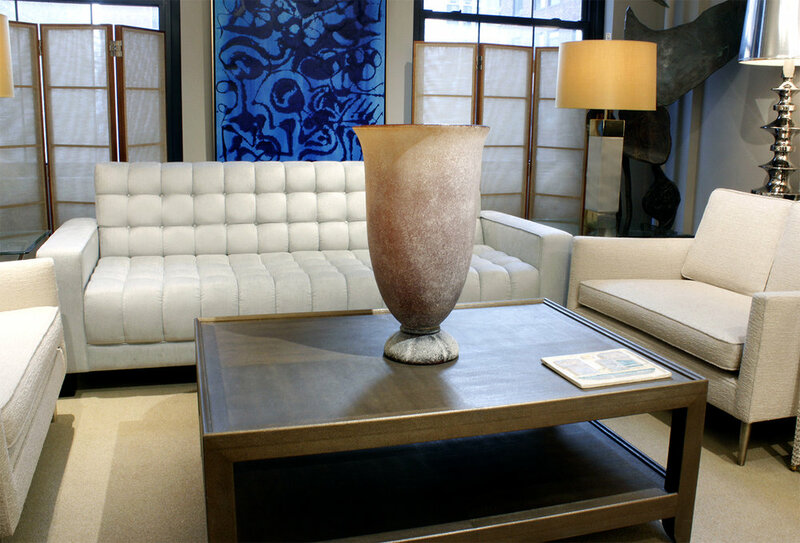 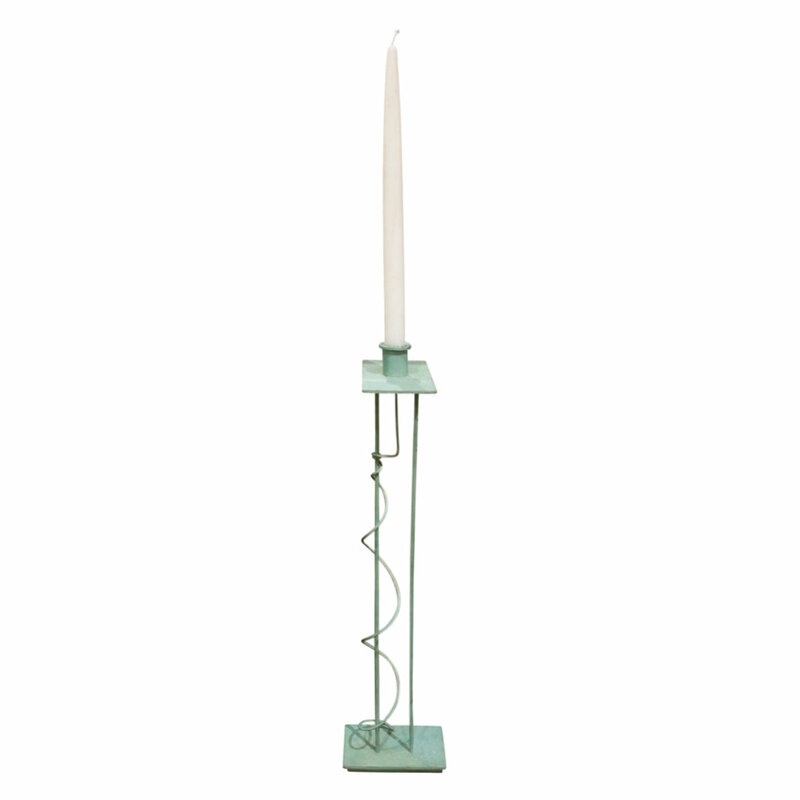 Johnson and Marcius made special pieces which were sold through the Karl Springer showroom. 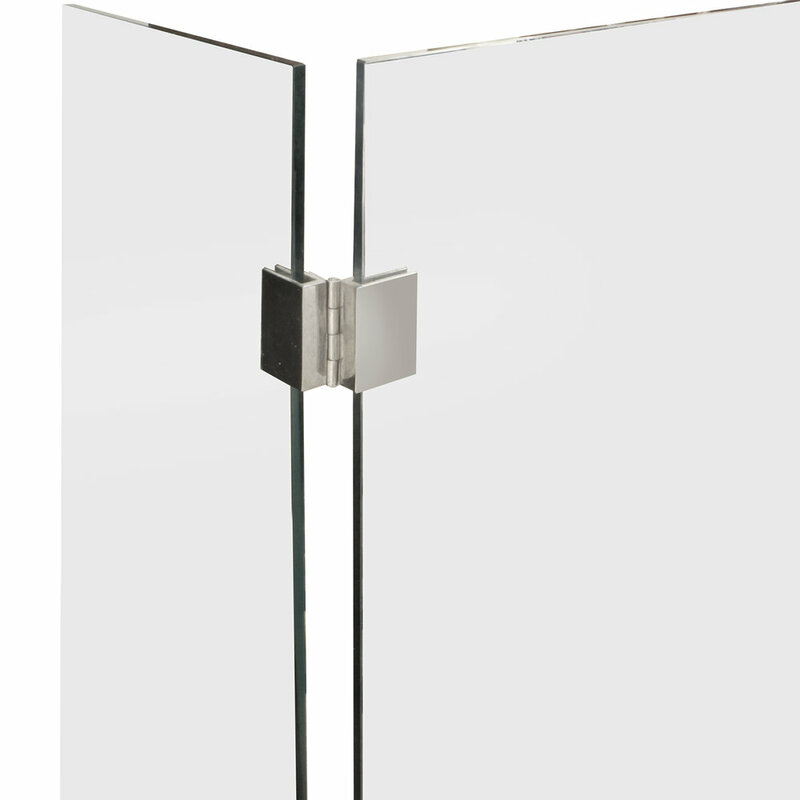 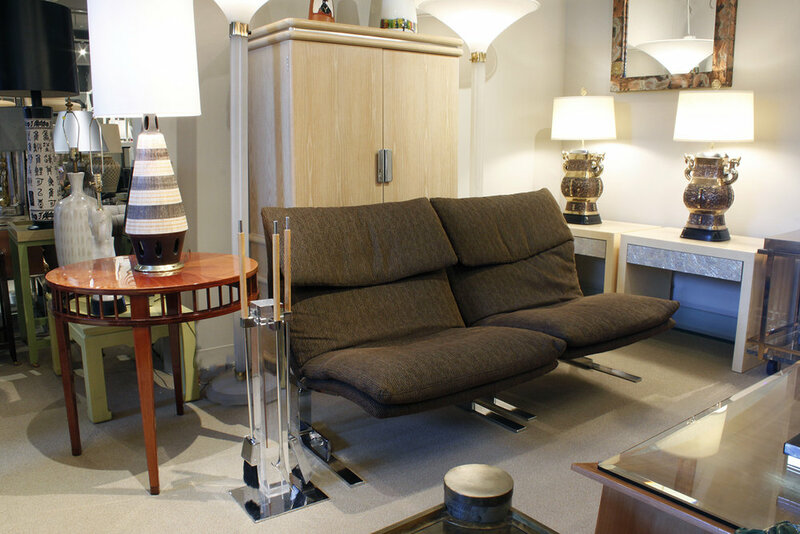 Fire screen model #1982-C in glass with chrome hinges and feet by Danny Allessandro and sold through Holly Hunt, American 1980's. 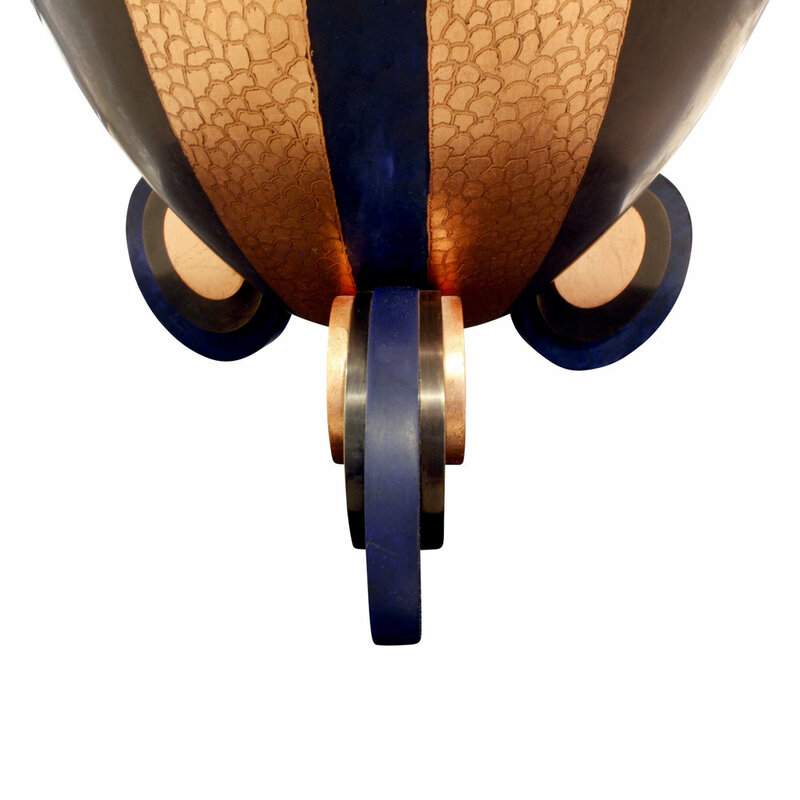 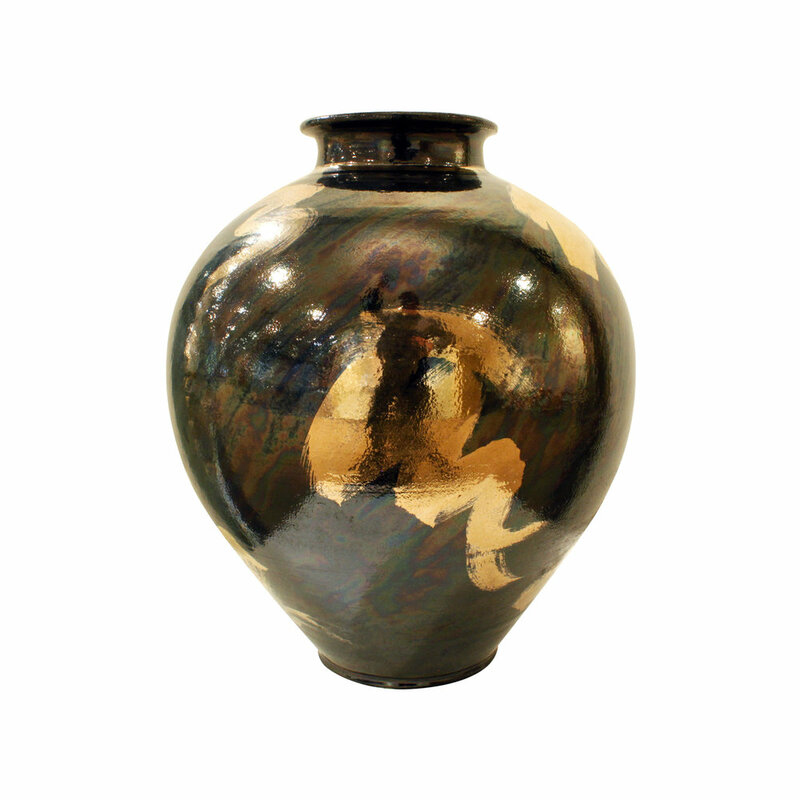 Large and exceptional Art Deco urn in bronze and etched copper with disc feet by Karl Springer, American 1980's. 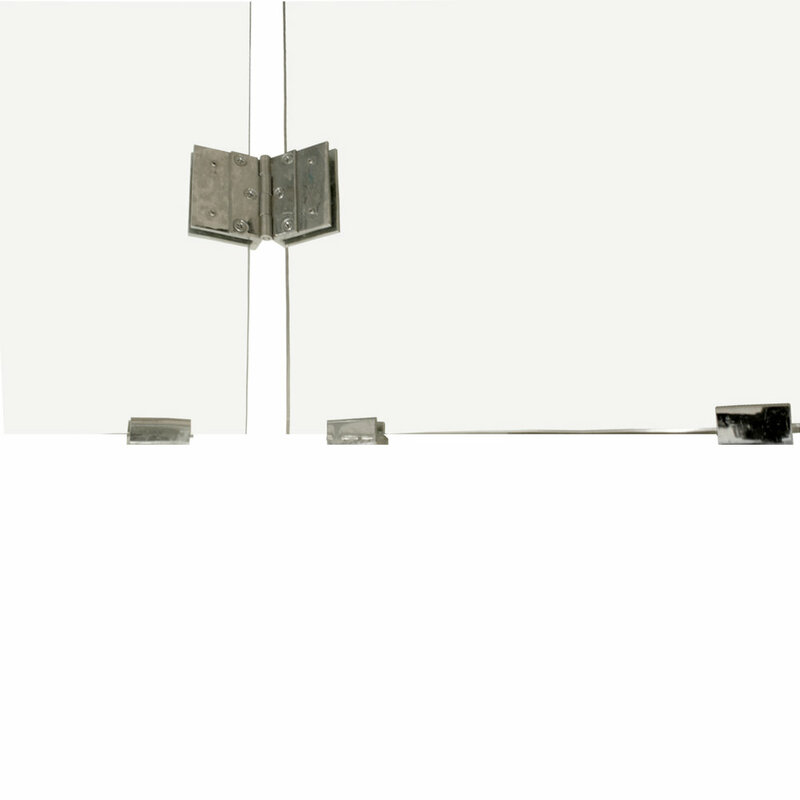 This is a rare Springer design with impressive scale. 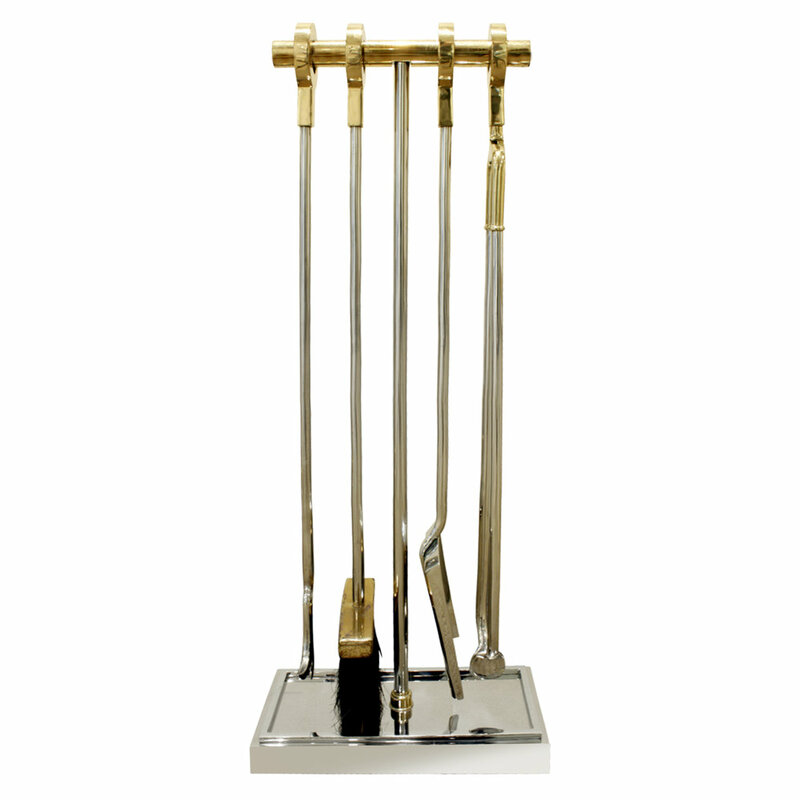 Fireplace tool set with upright post in figured black marble and tools in brass by Albrizzi, American 1970's. 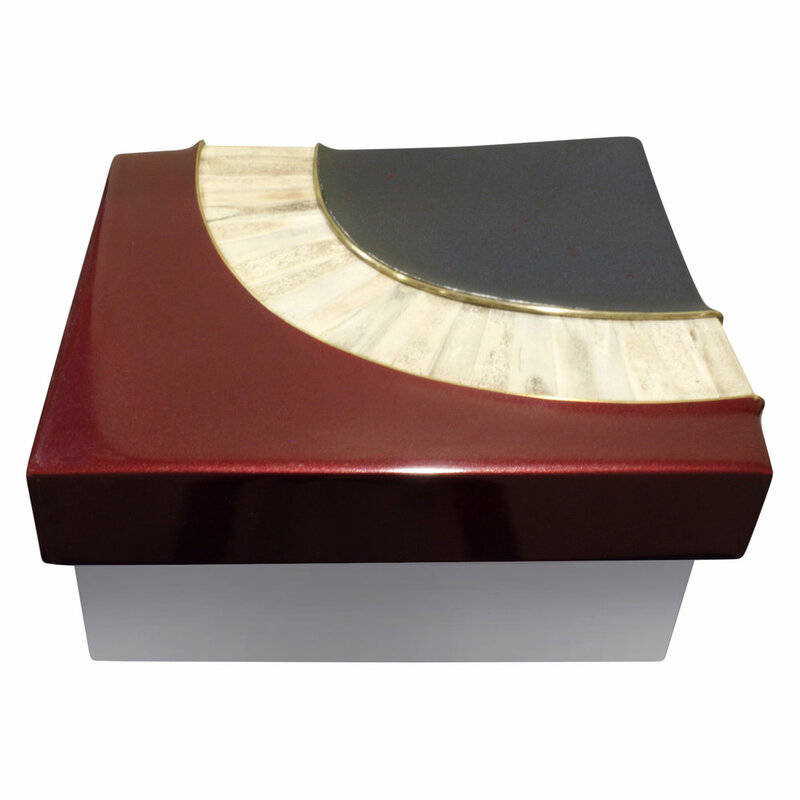 Small artisan card box in bone by Karl Springer, American 1970's. 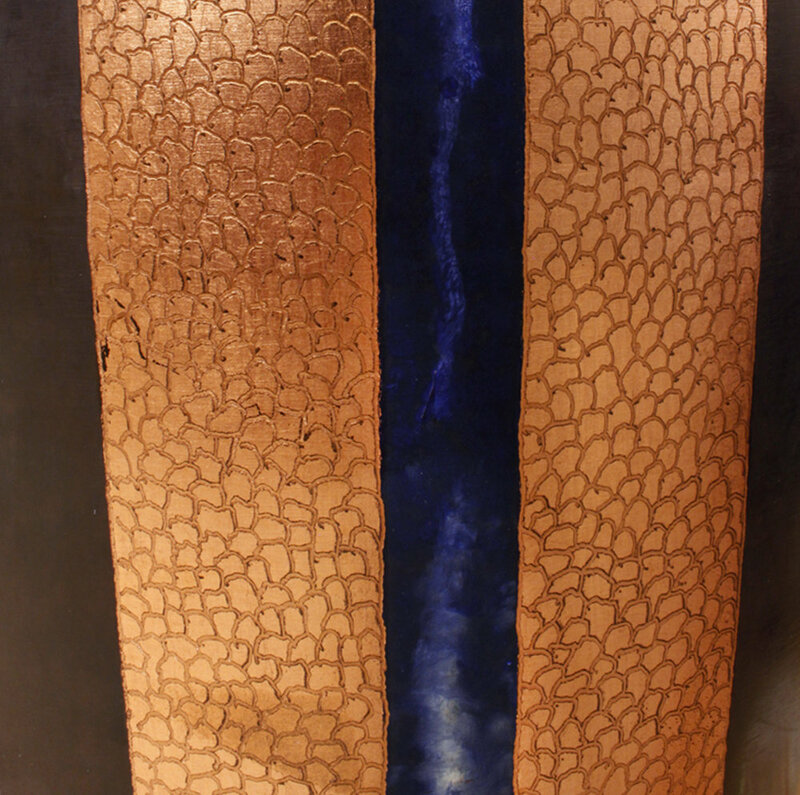 Interior is lined in velvet. 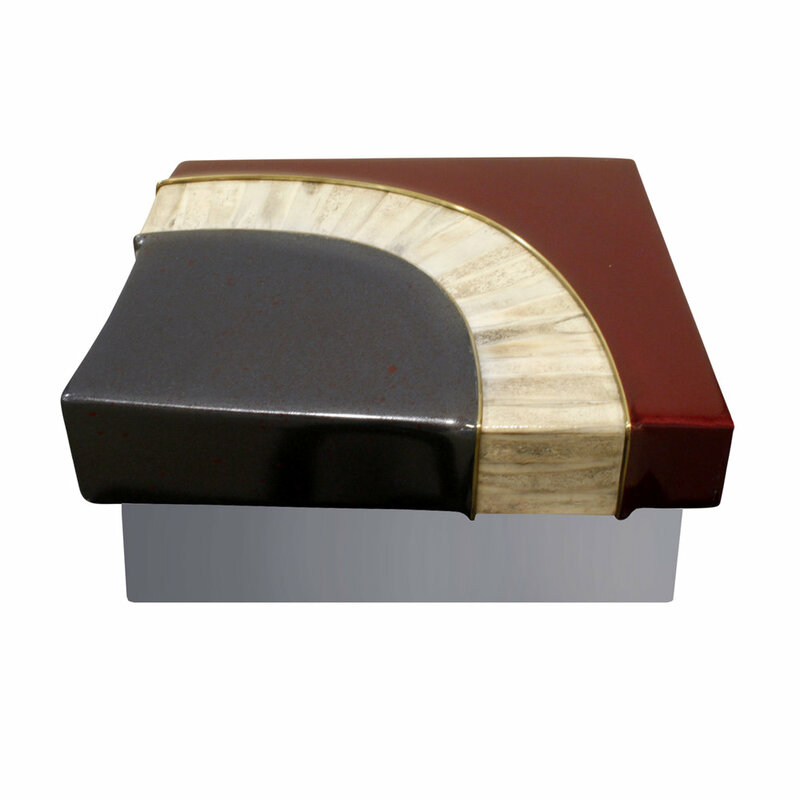 This is designed for playing cards and is very chic. 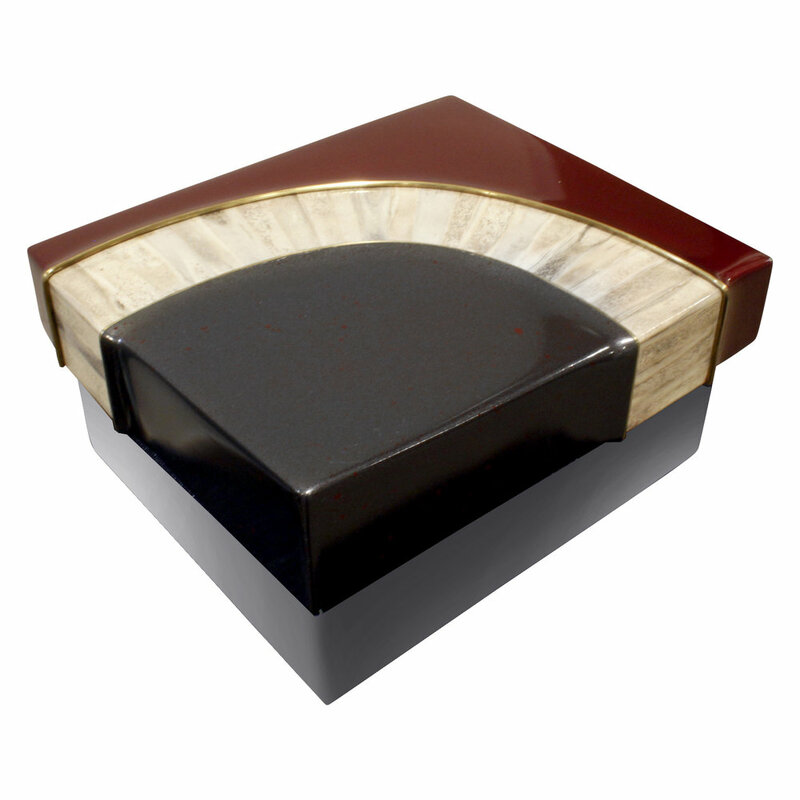 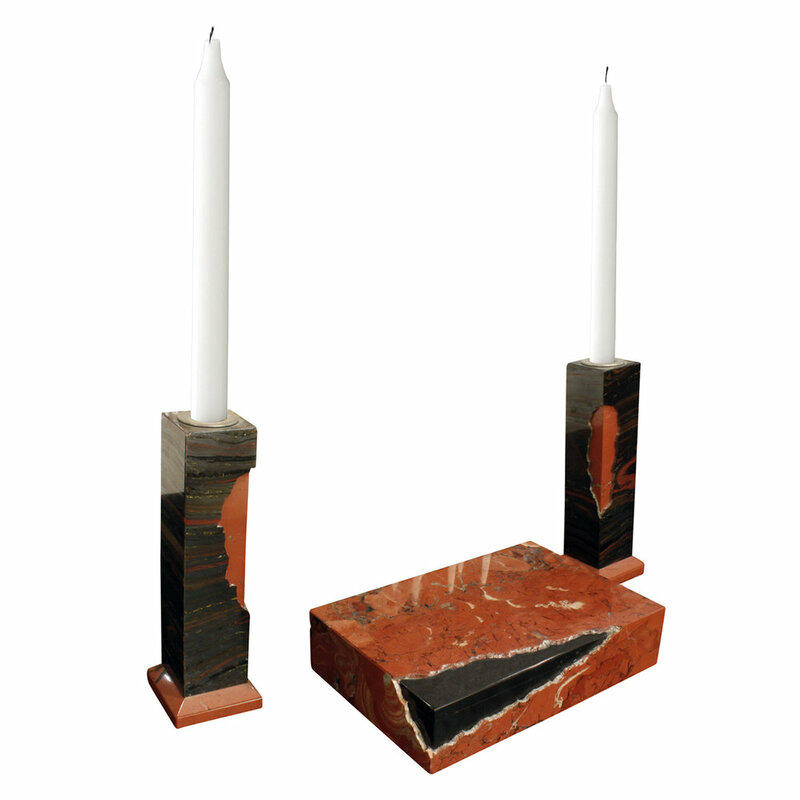 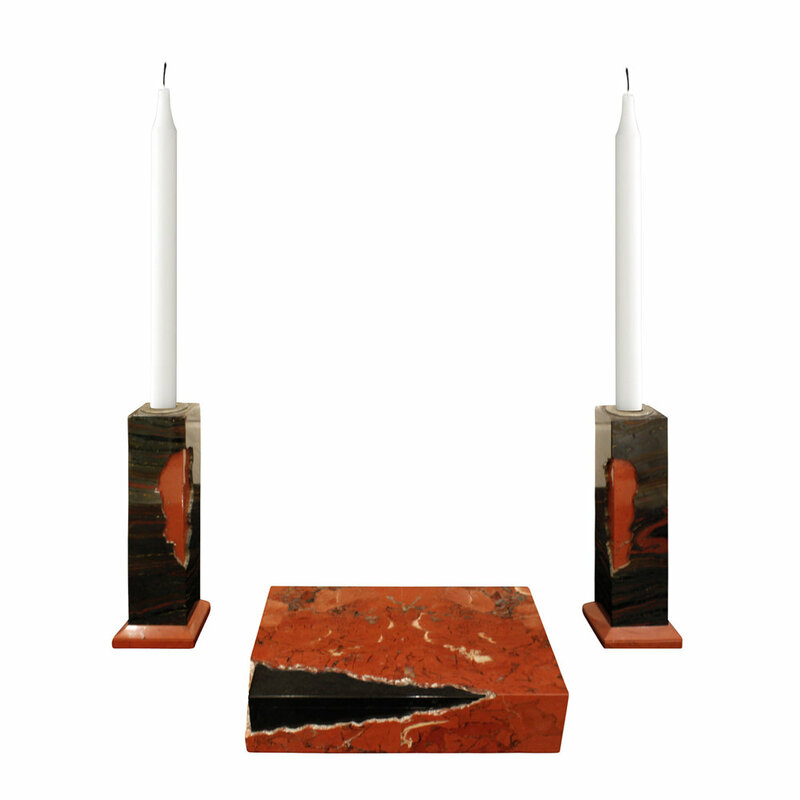 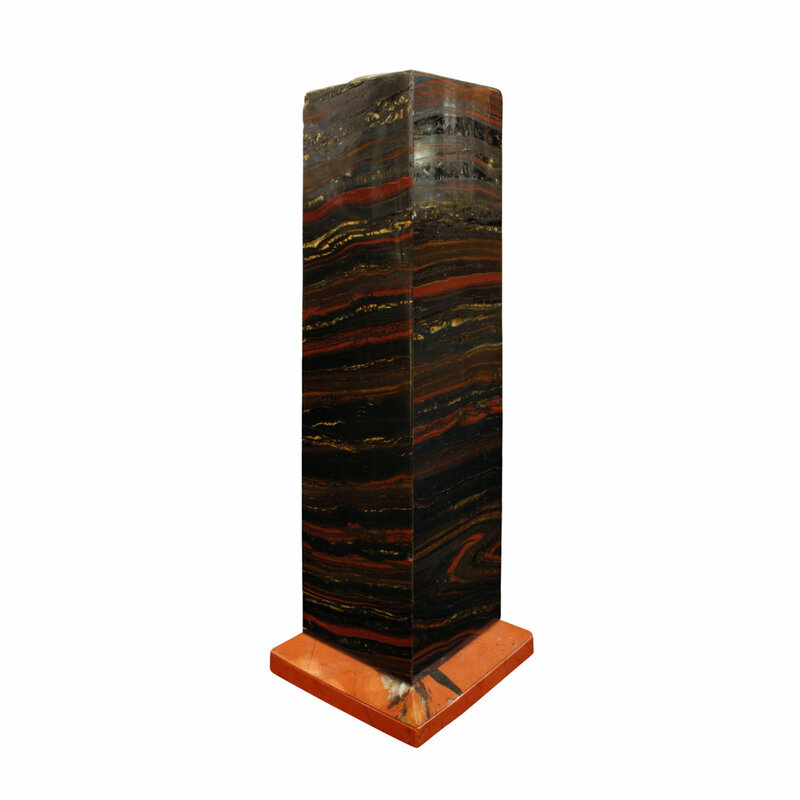 Artisan hinged box with matching candle holders in red jasper and black marble with chipped edge design by Karl Springer, American 1980's. 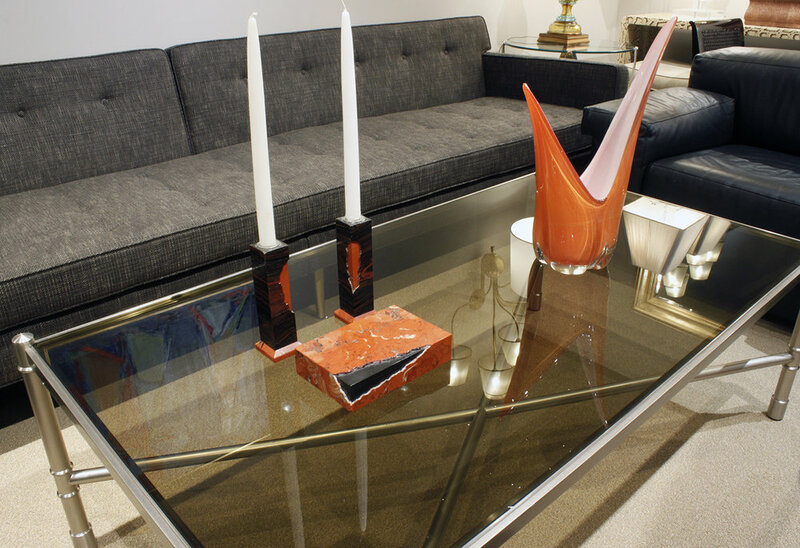 These accessories were made by artists and sold through the Karl Springer showroom. 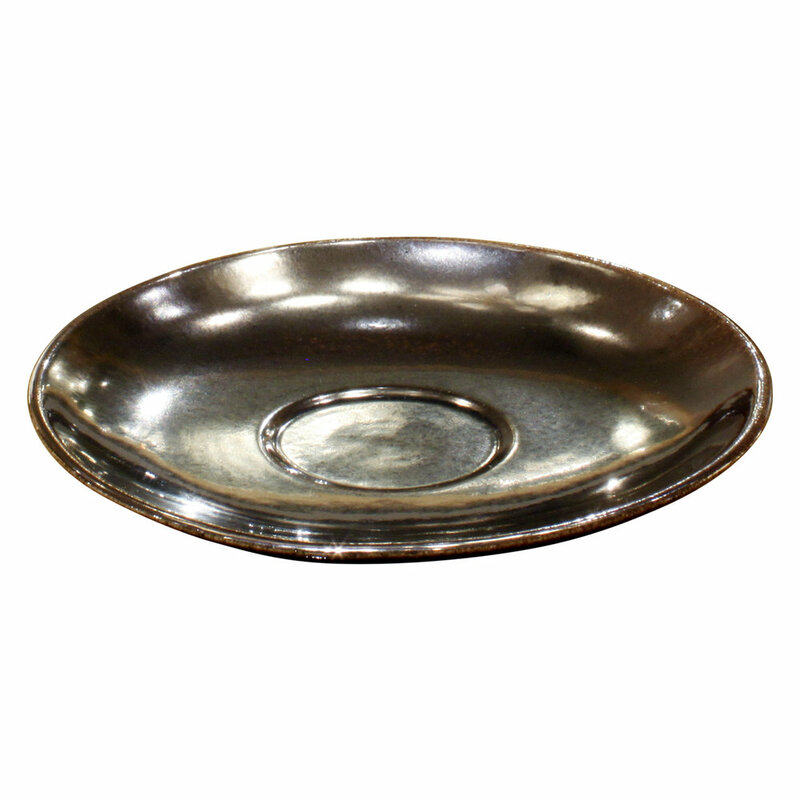 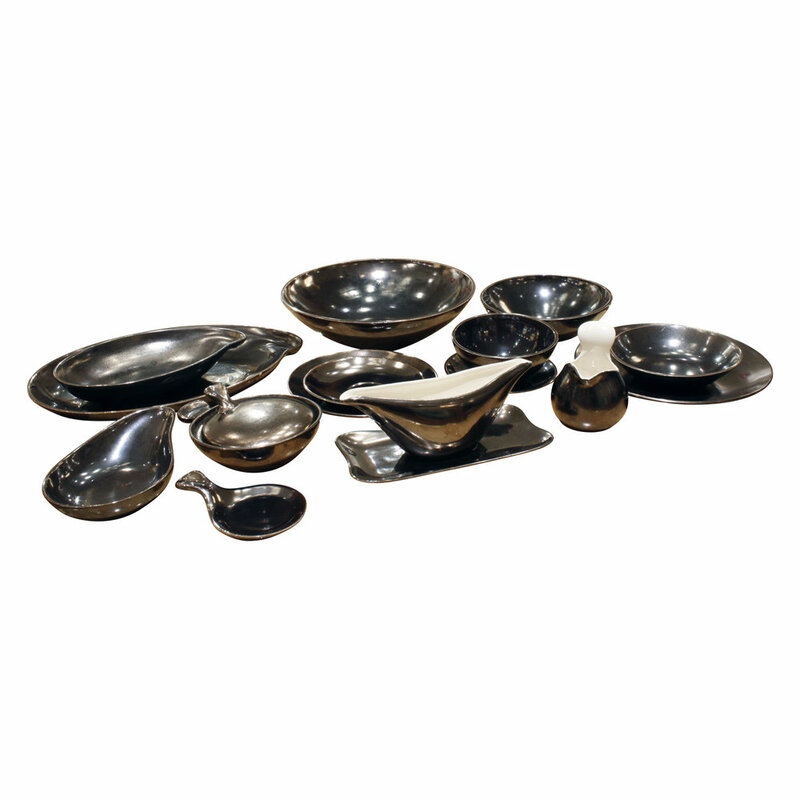 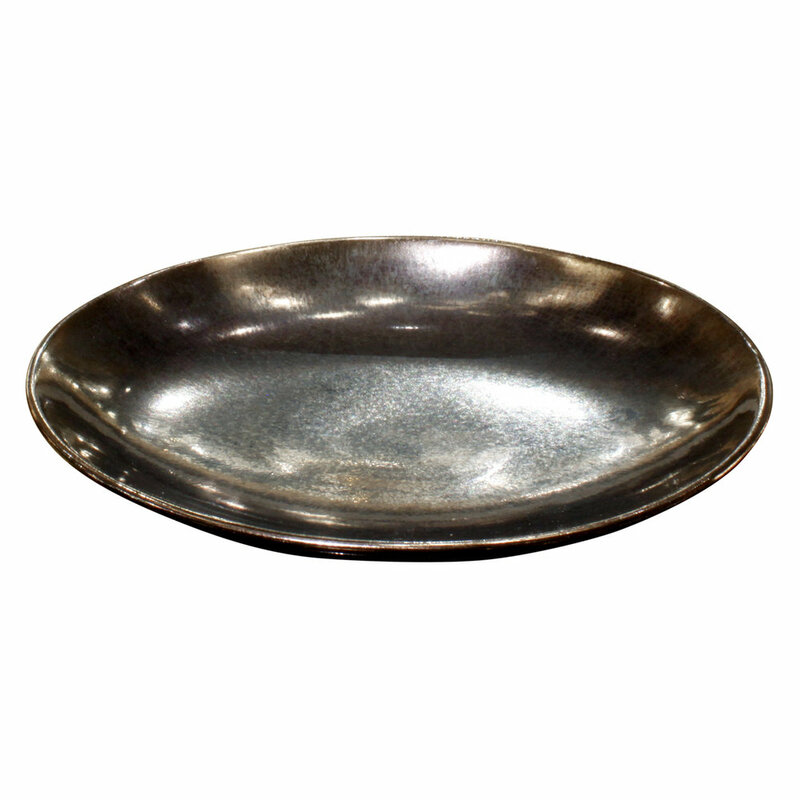 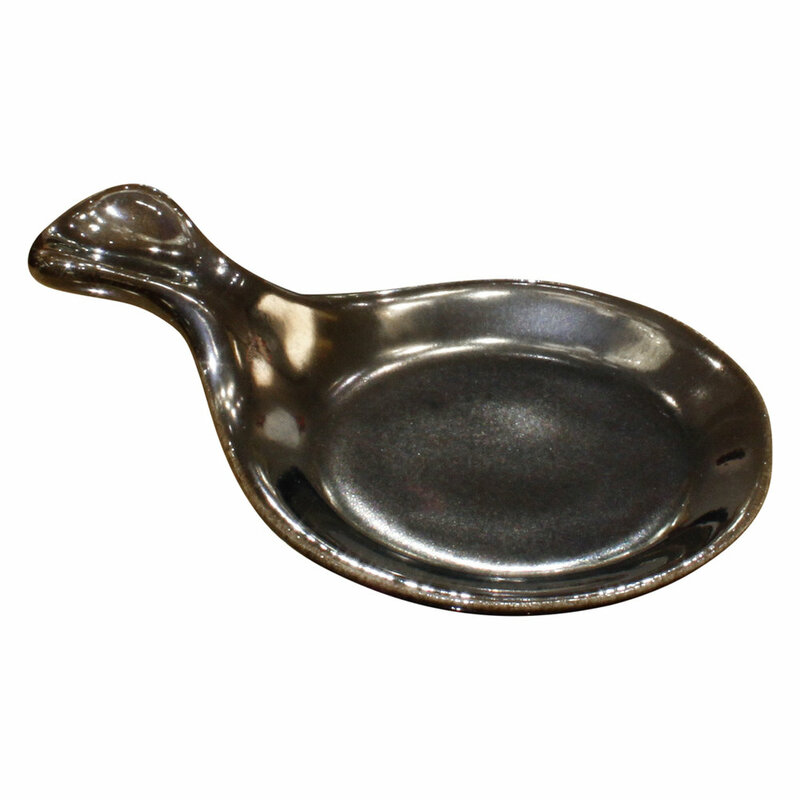 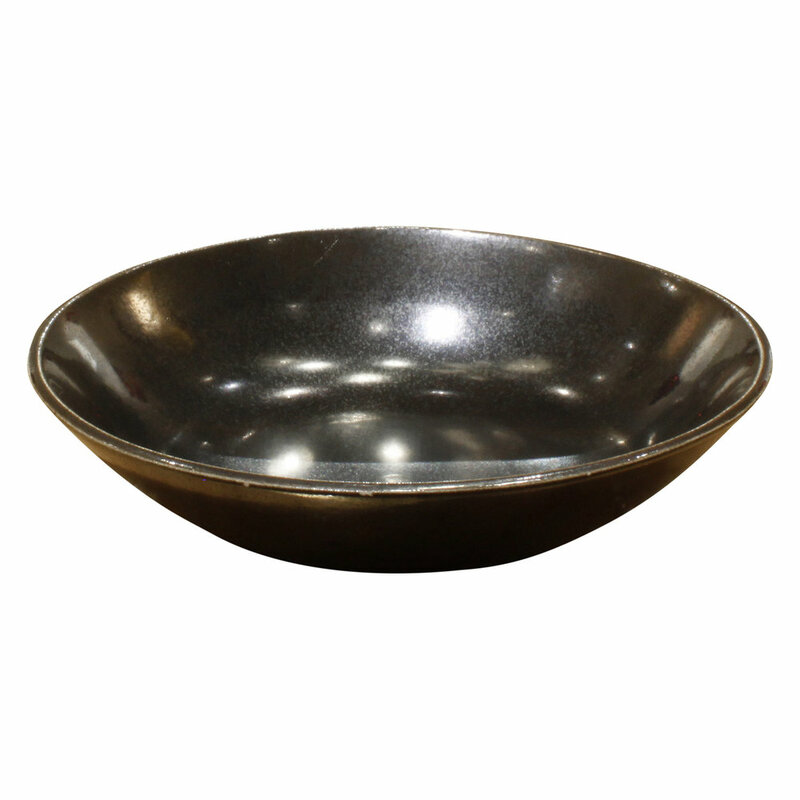 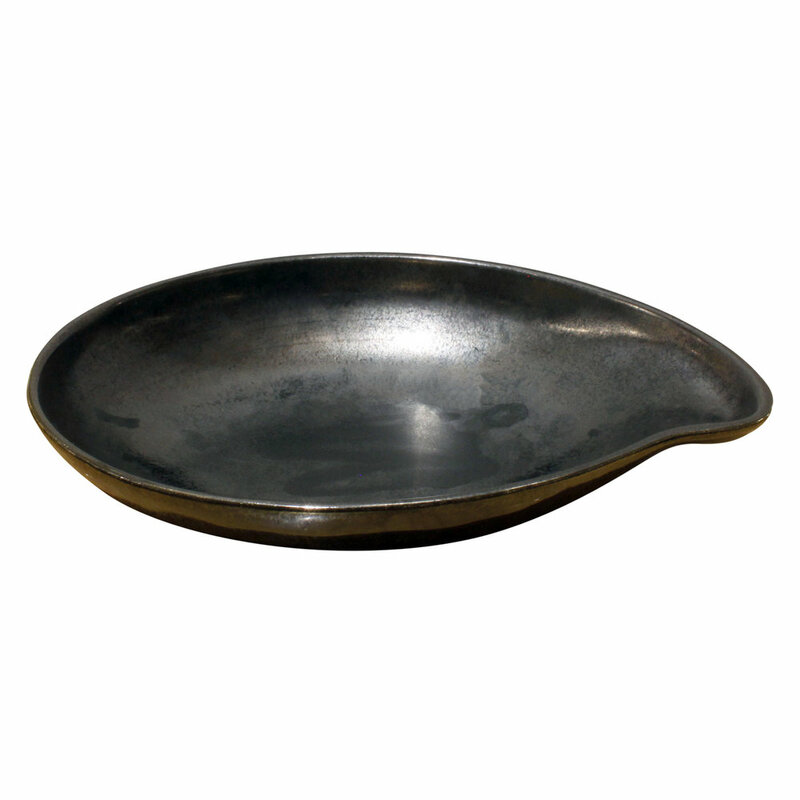 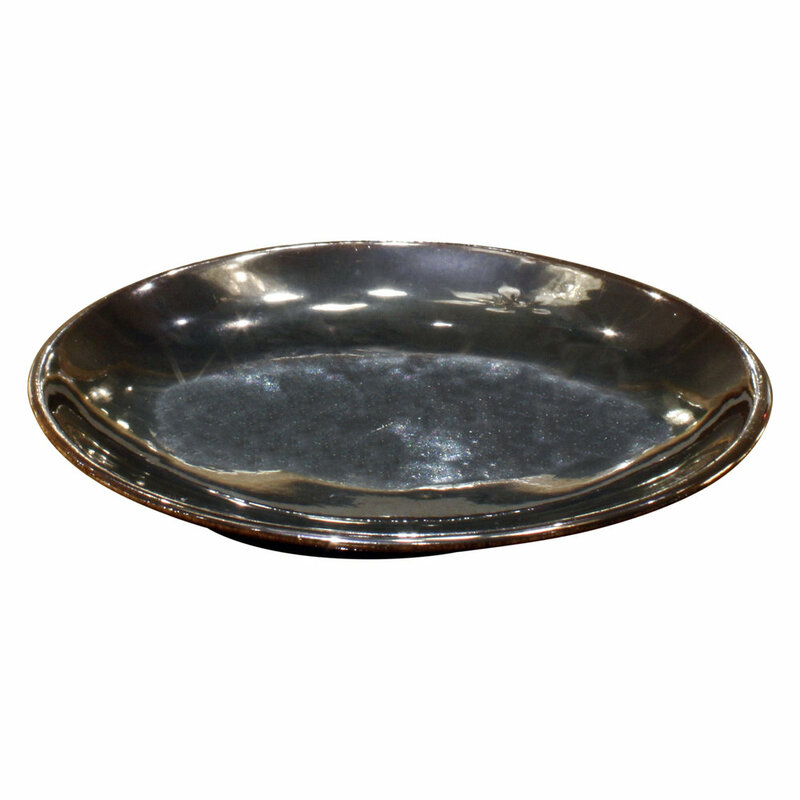 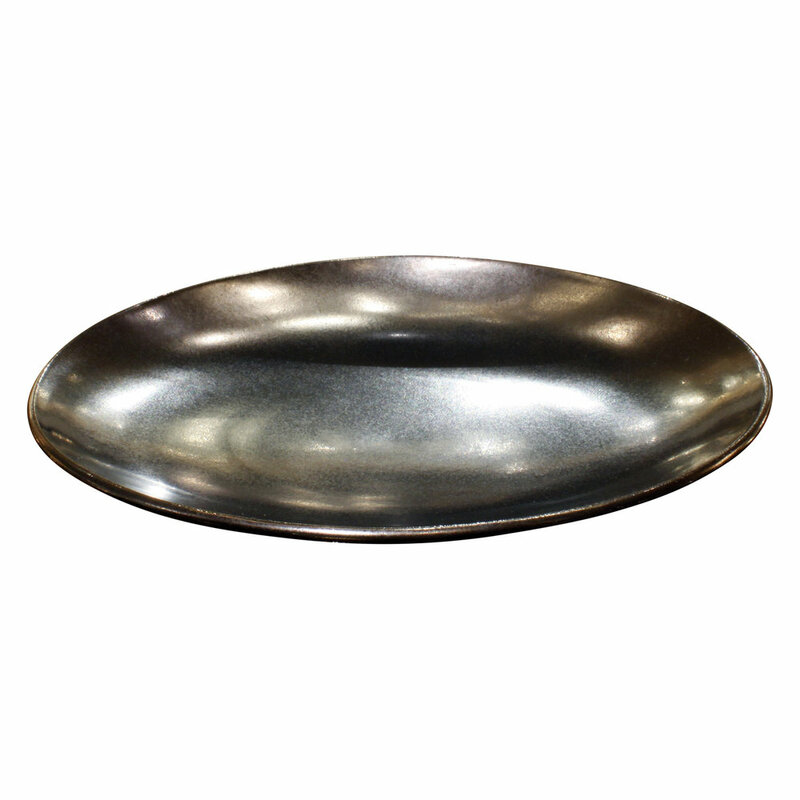 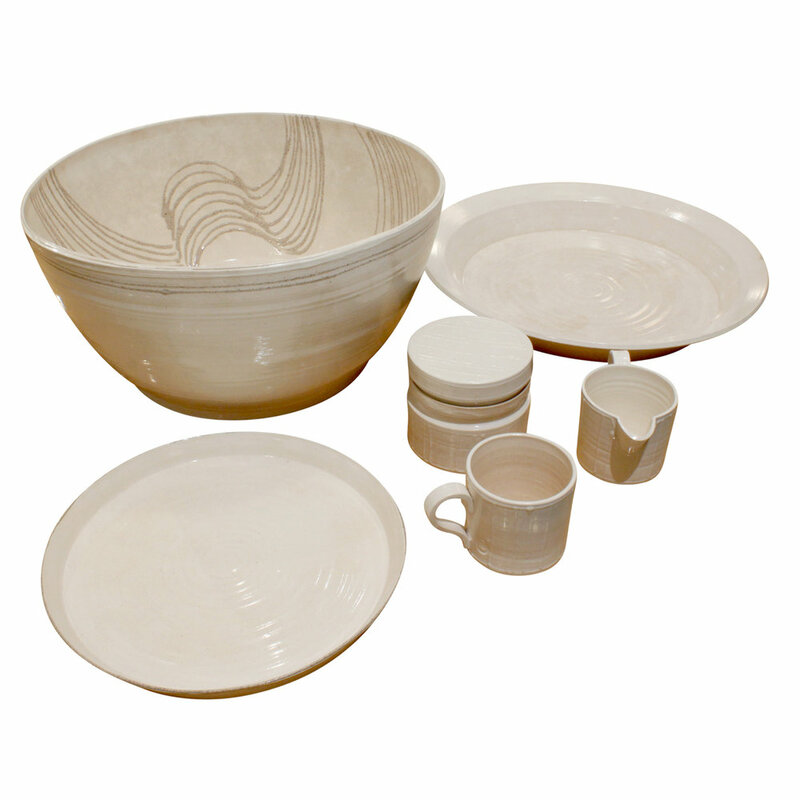 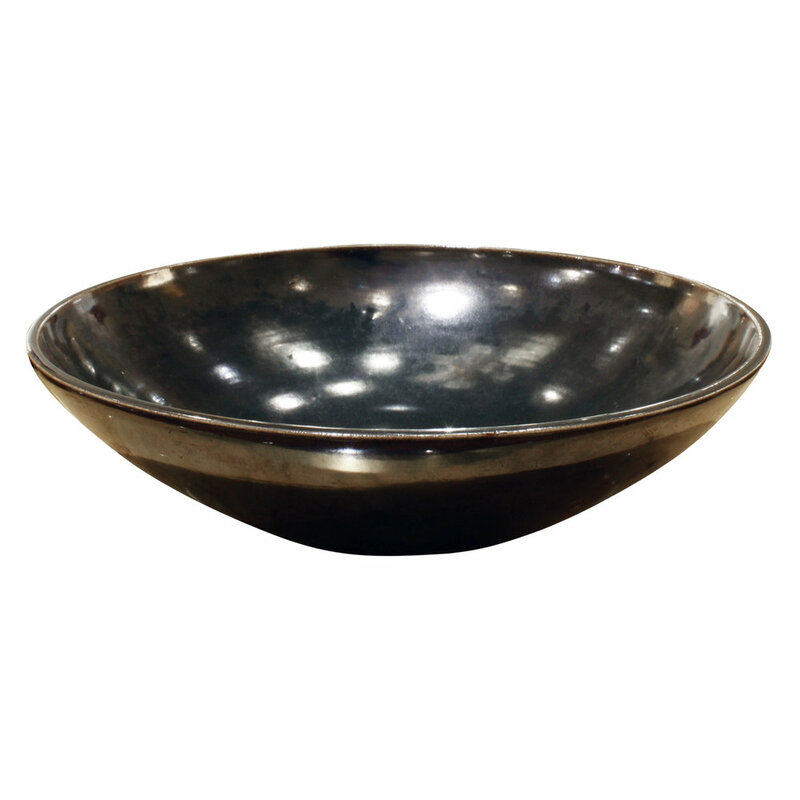 Rare and important 59 piece set of studio made service ware (plates, lidded bowls, serving pieces) in a gunmetal glaze by Eva Zeisel, American 1940's. 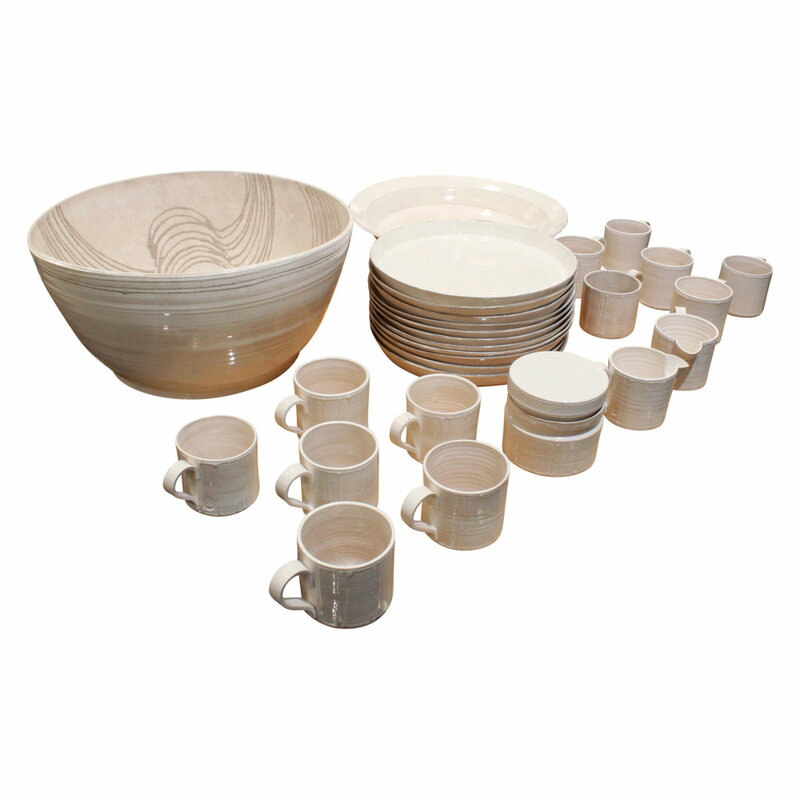 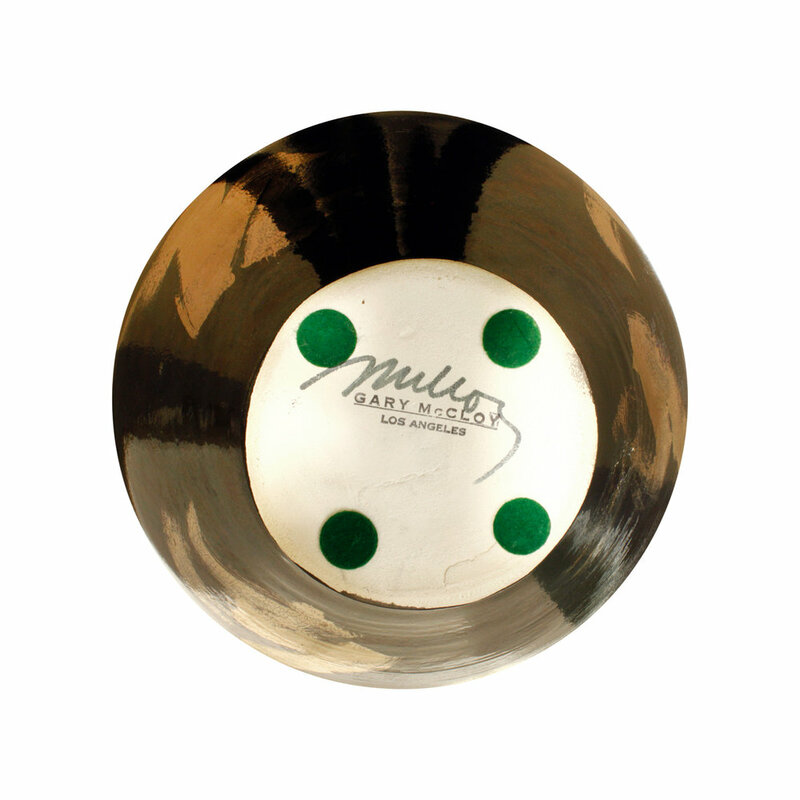 Rare and important 29 piece studio made set of ceramic plates, serving pieces, and cups by Roy Hamilton, American 1980's (signed and stamped on every piece). 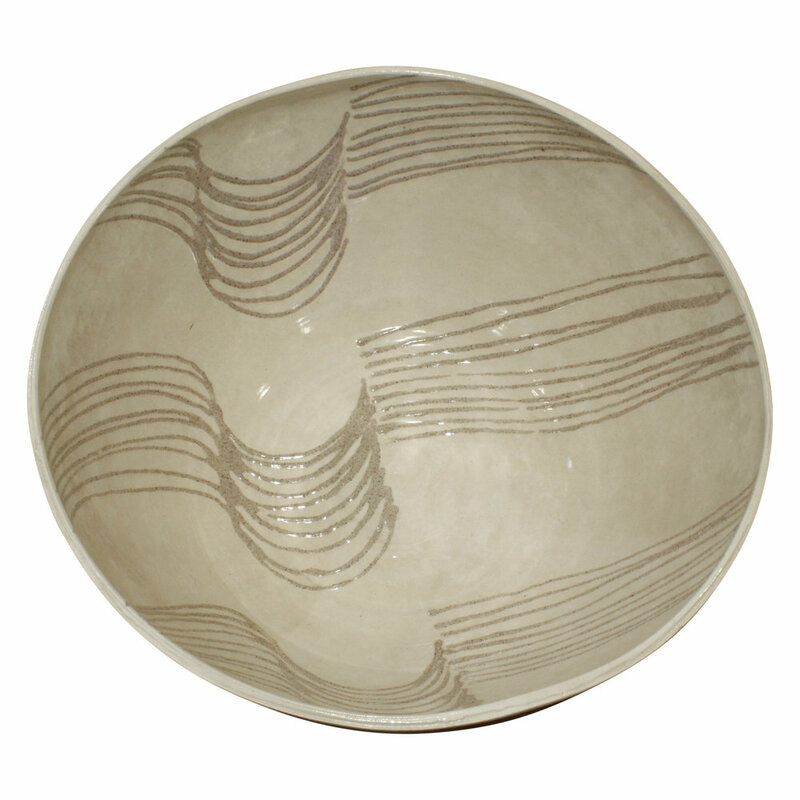 It is rare to find such a large service by Roy Hamilton. 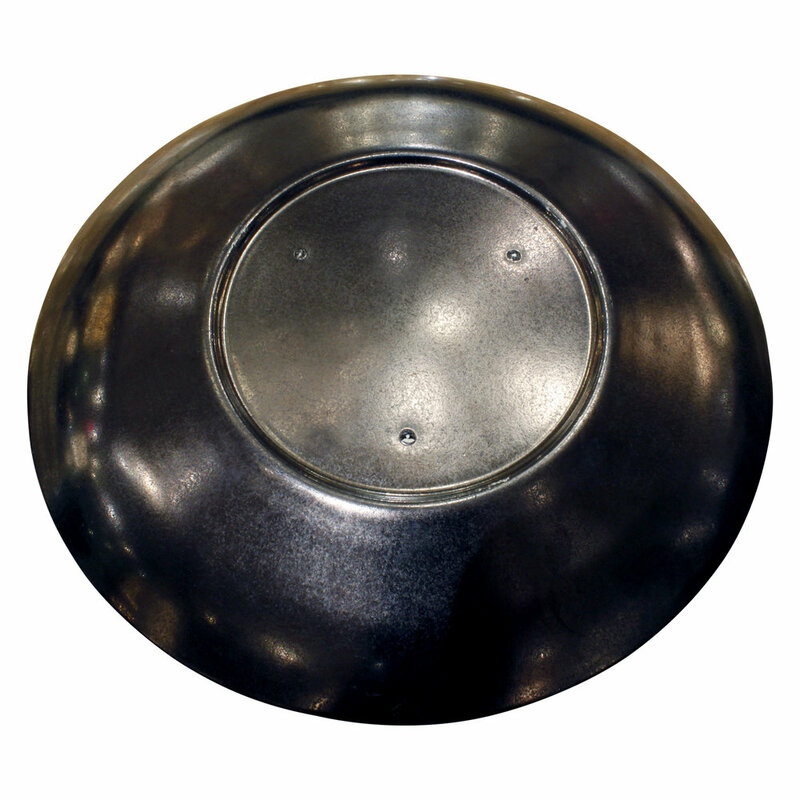 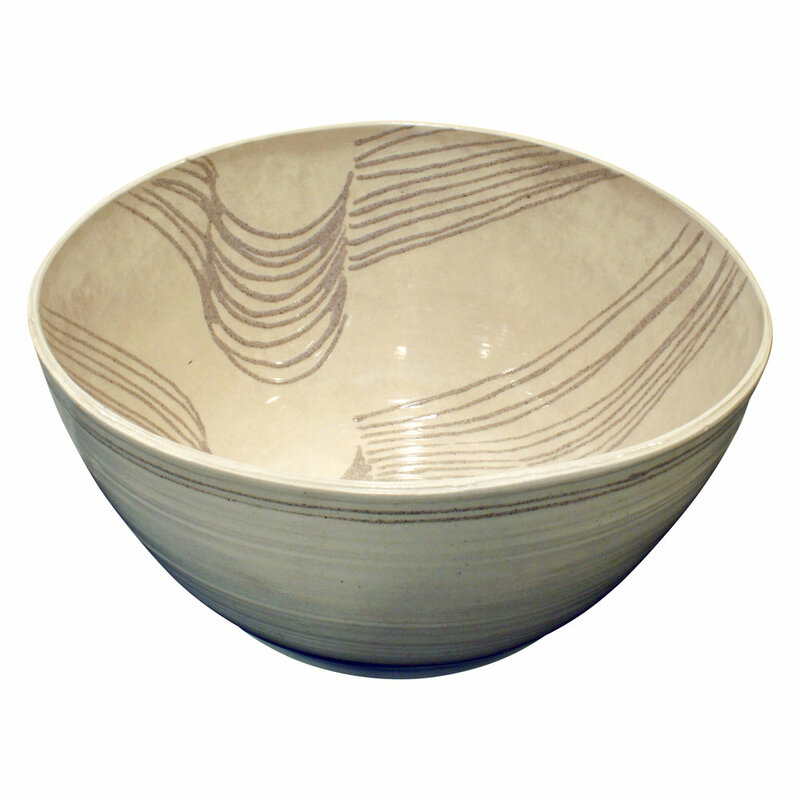 Condition: Excellent / except for 2 pieces: large serving dish has a hairline crack which is stable and 1 plate has a repaired crack. 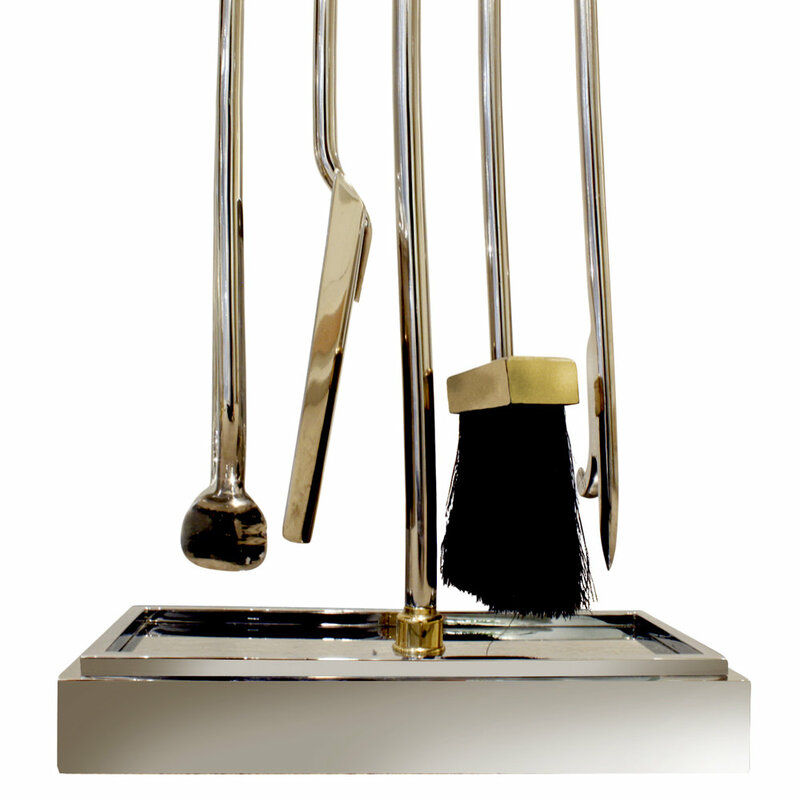 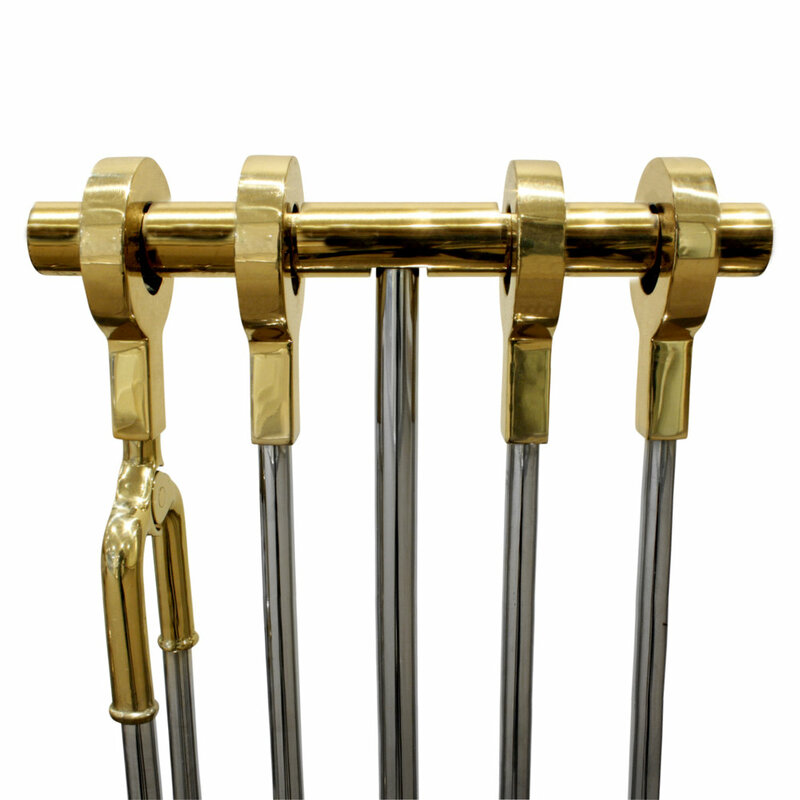 Tool set model #196-02 in steel and brass by Danny Alessandro and sold through Holly Hunt, American 1980's. 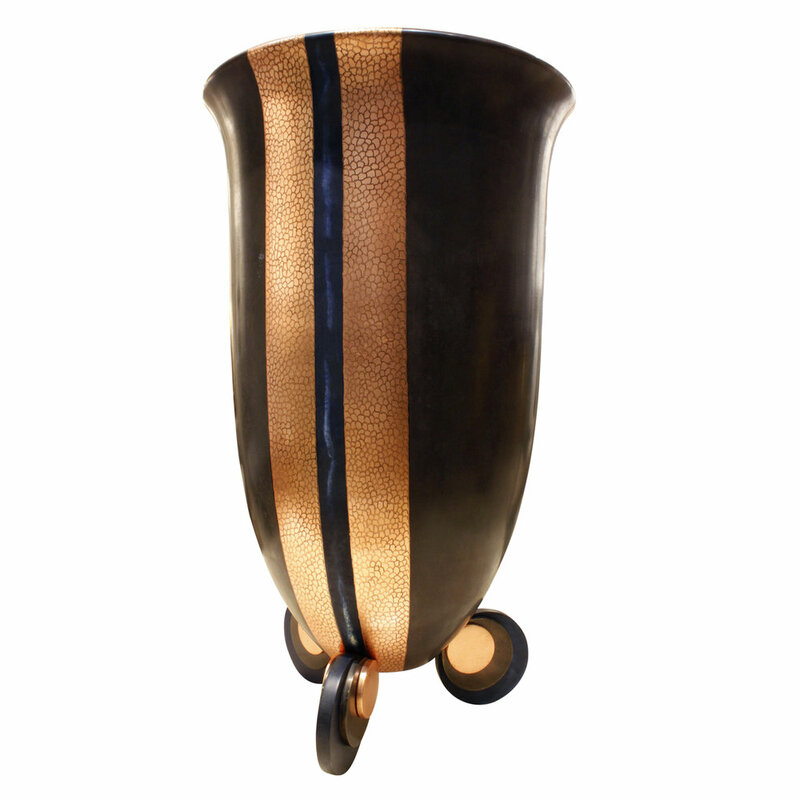 Large and exceptional Art Deco urn in bronze and etched copper with disc feet by Karl Springer, American 1980's. 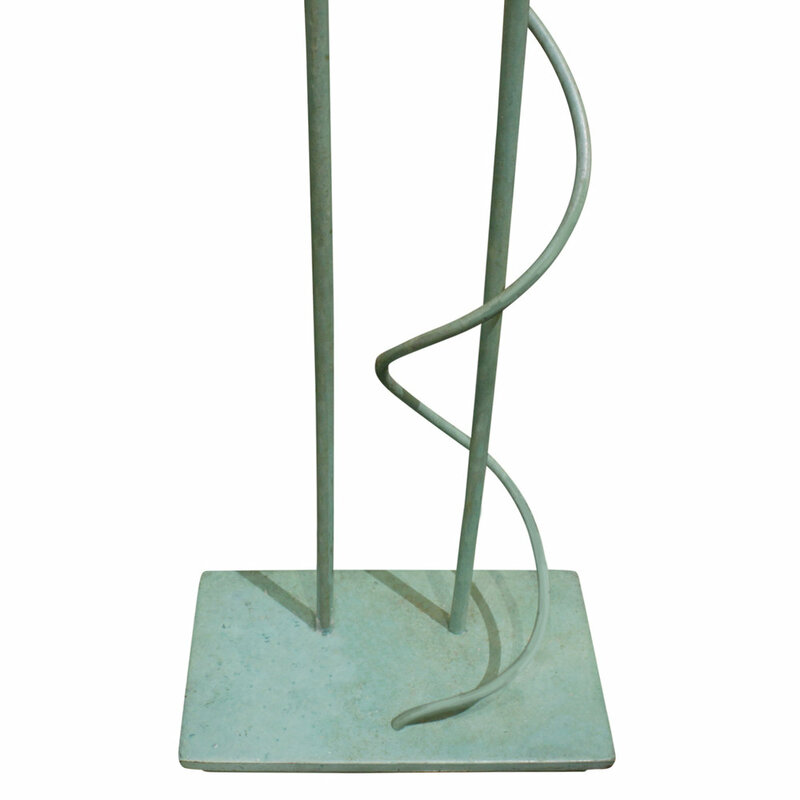 This is a rare Karl Springer design. 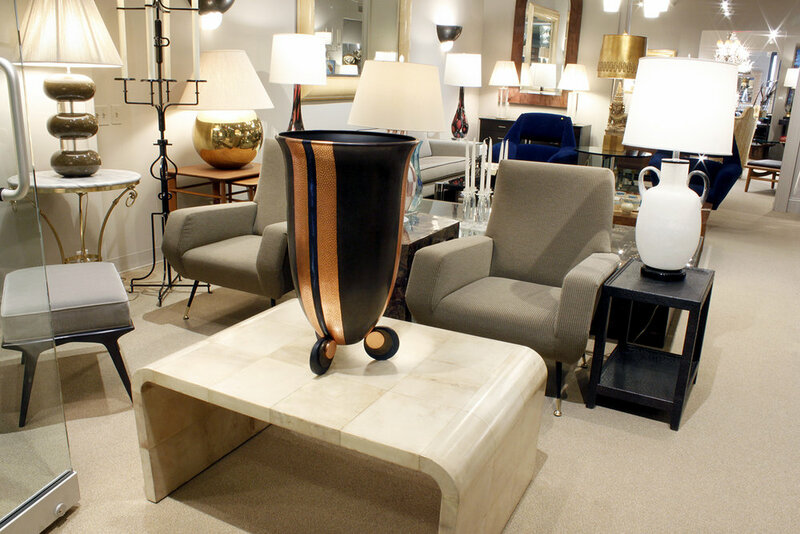 We have included a photo from our archive showing the urn in a photo from the Karl Springer showroom in the 1980's. 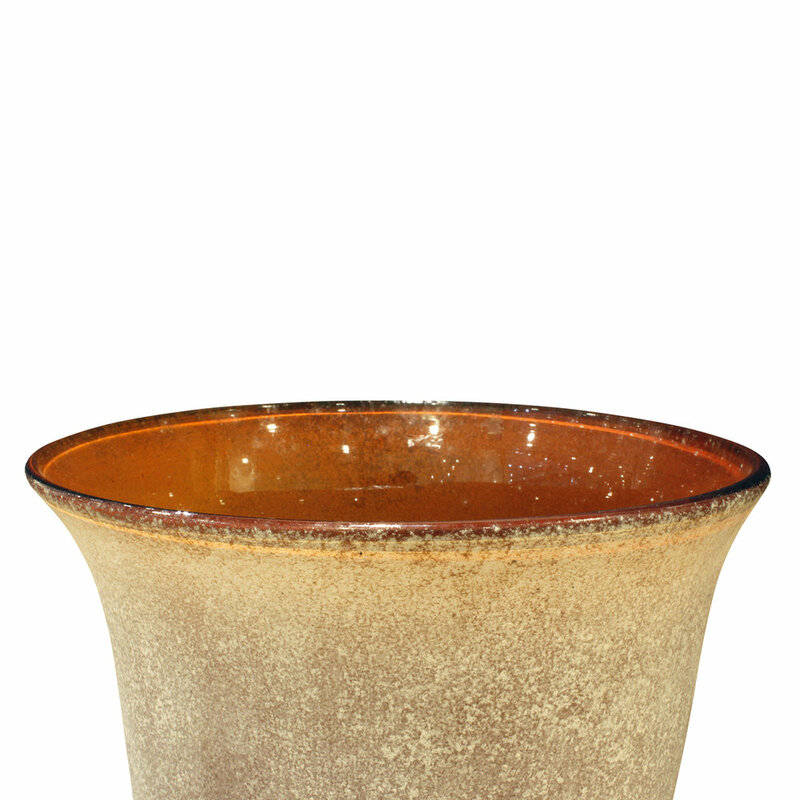 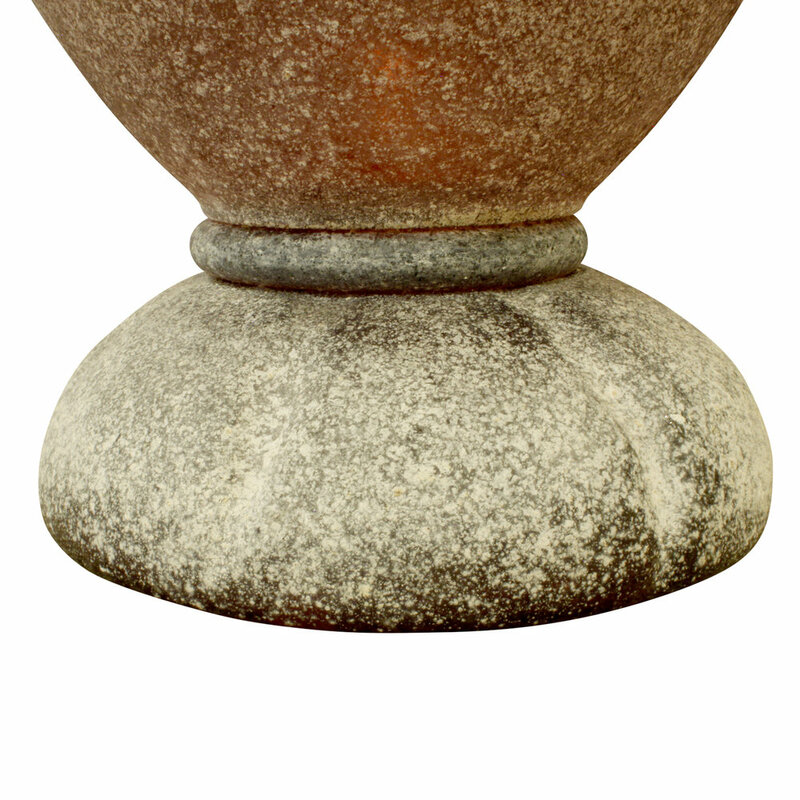 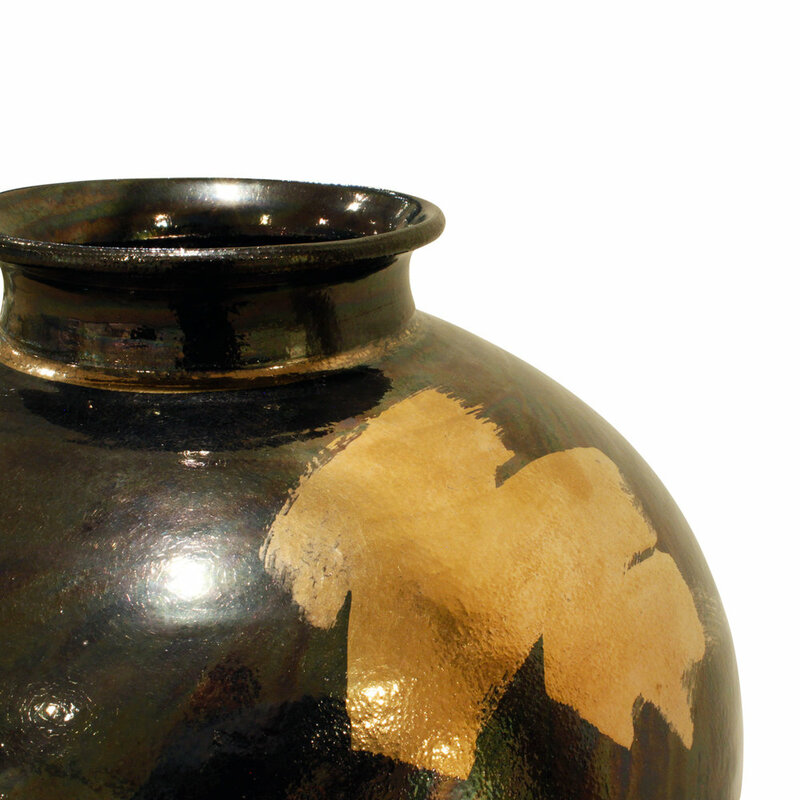 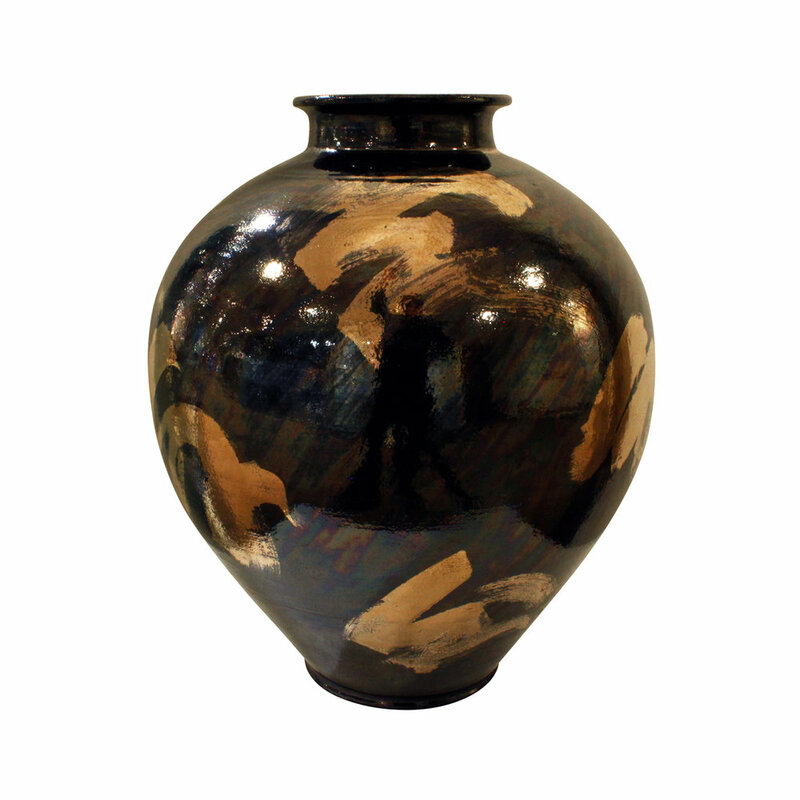 Hand-thrown ceramic vase with metallic gunmetal and gold glazes by Gary McCloy, American 1980s (signed on the bottom "Gary McCloy Los Angeles"). 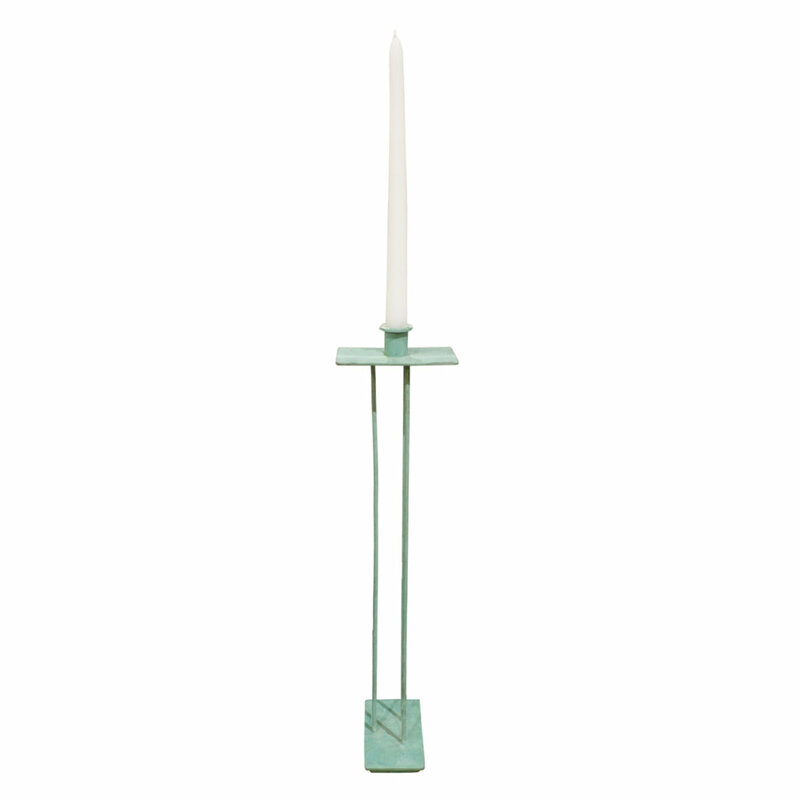 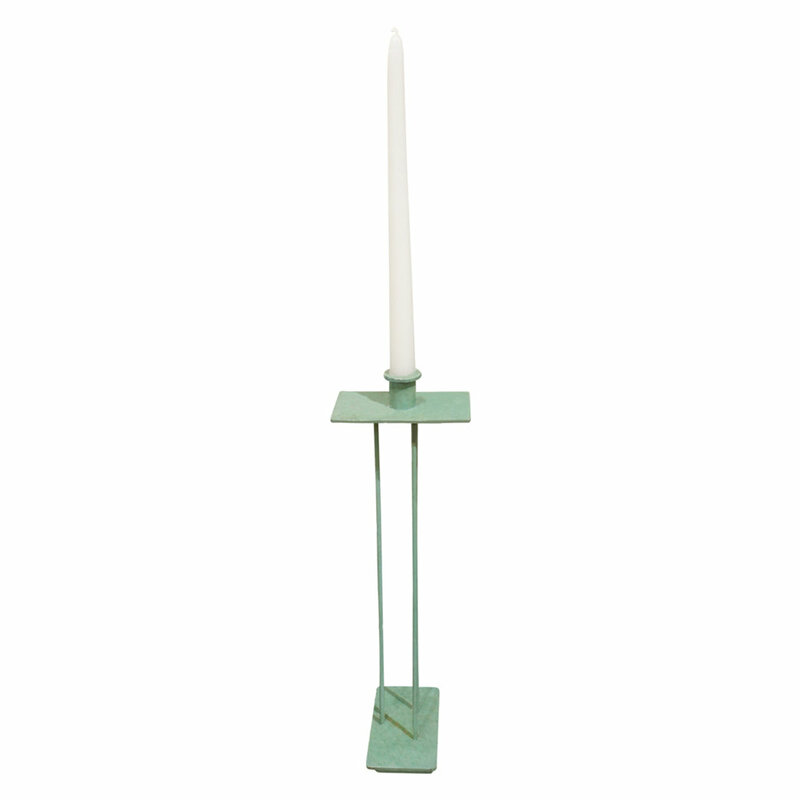 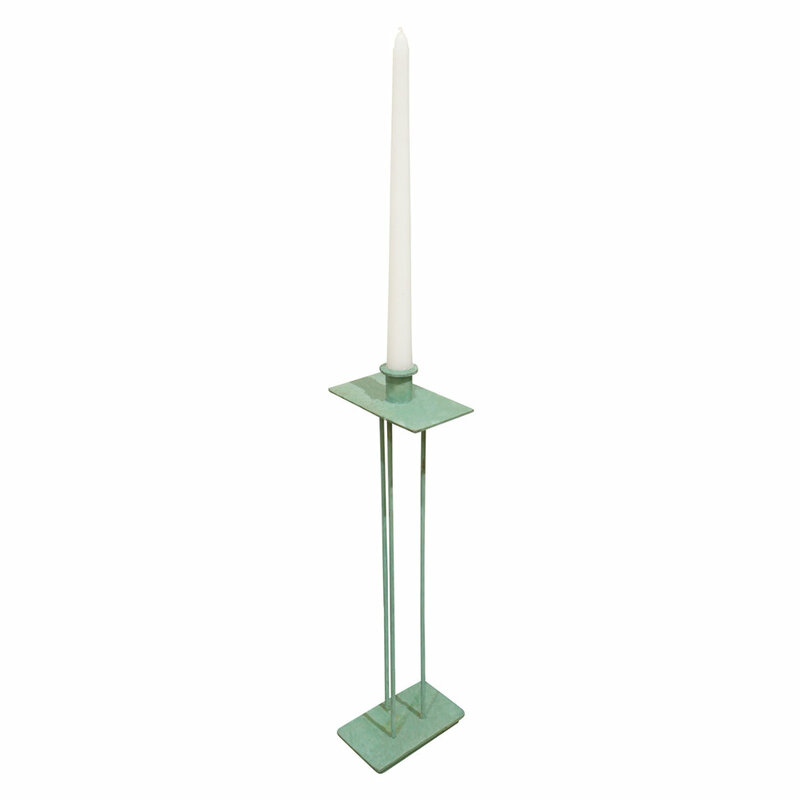 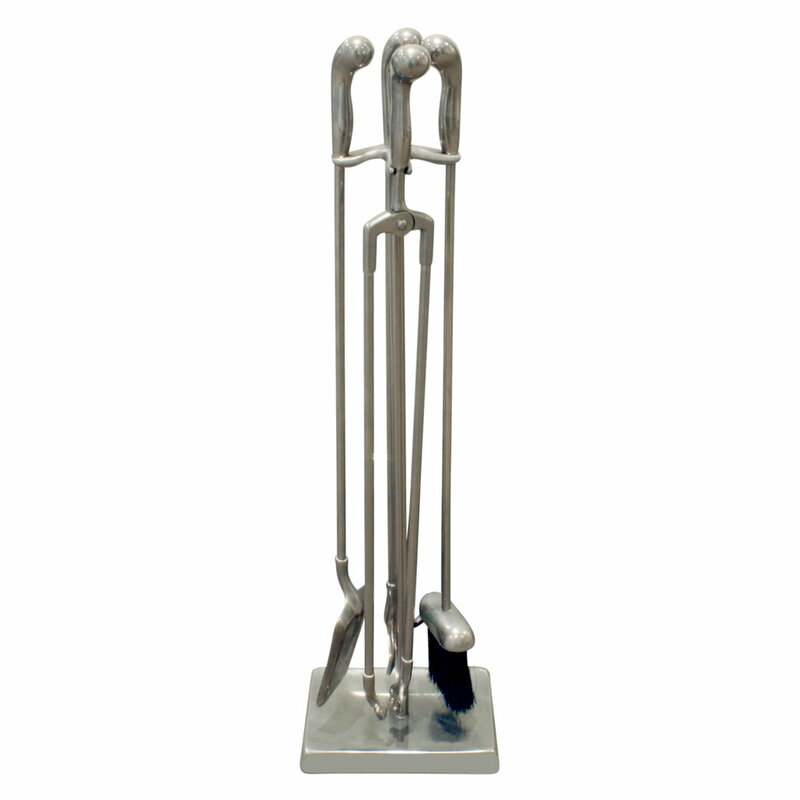 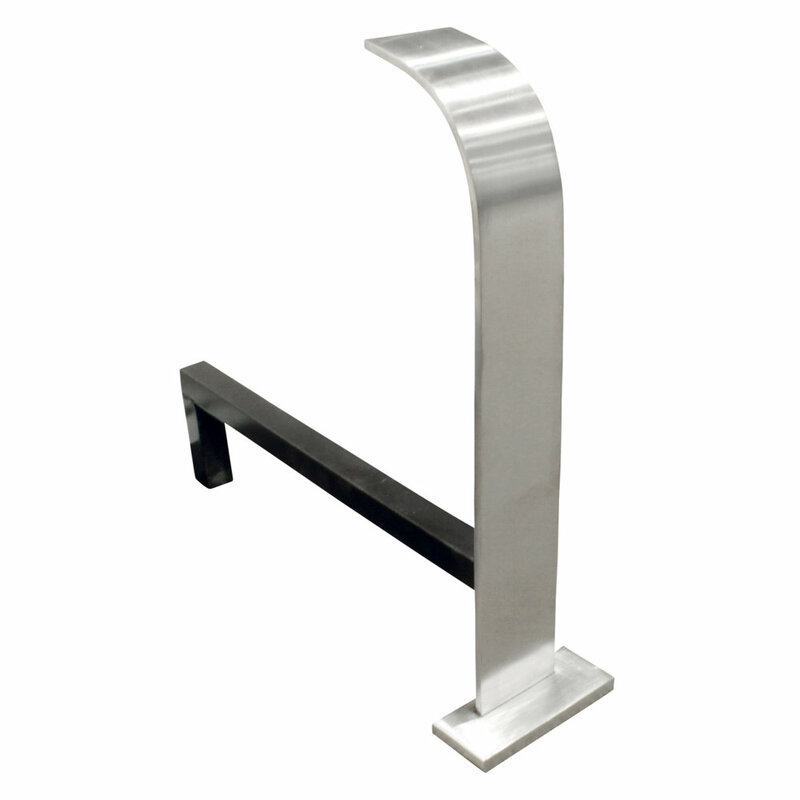 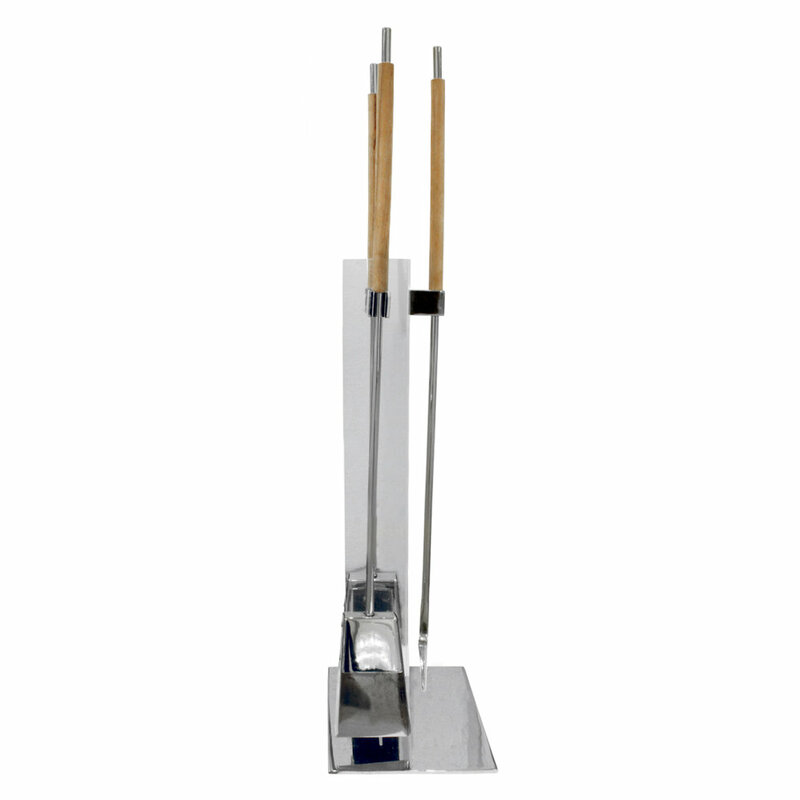 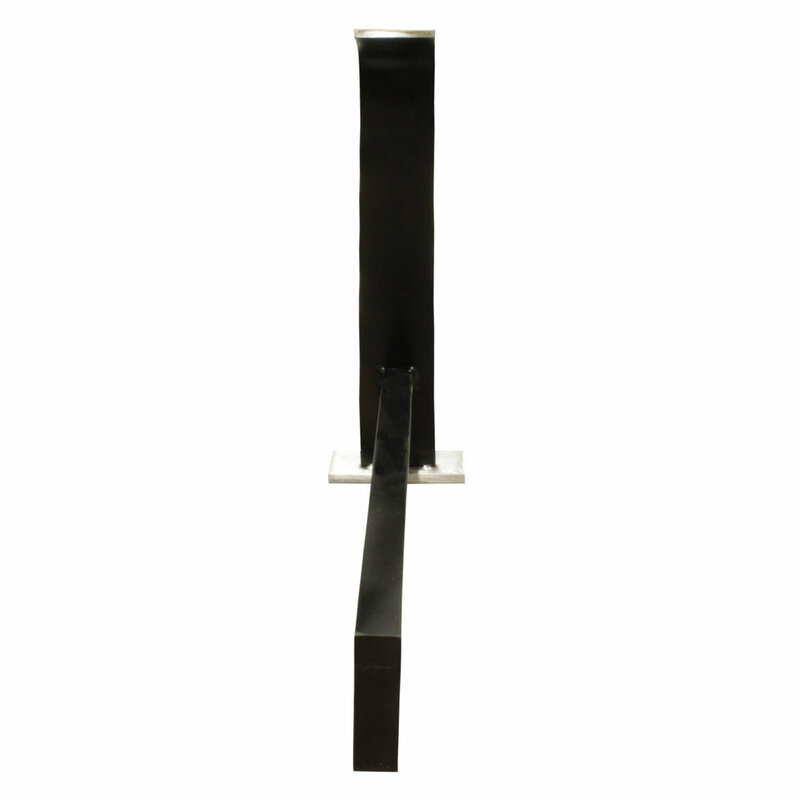 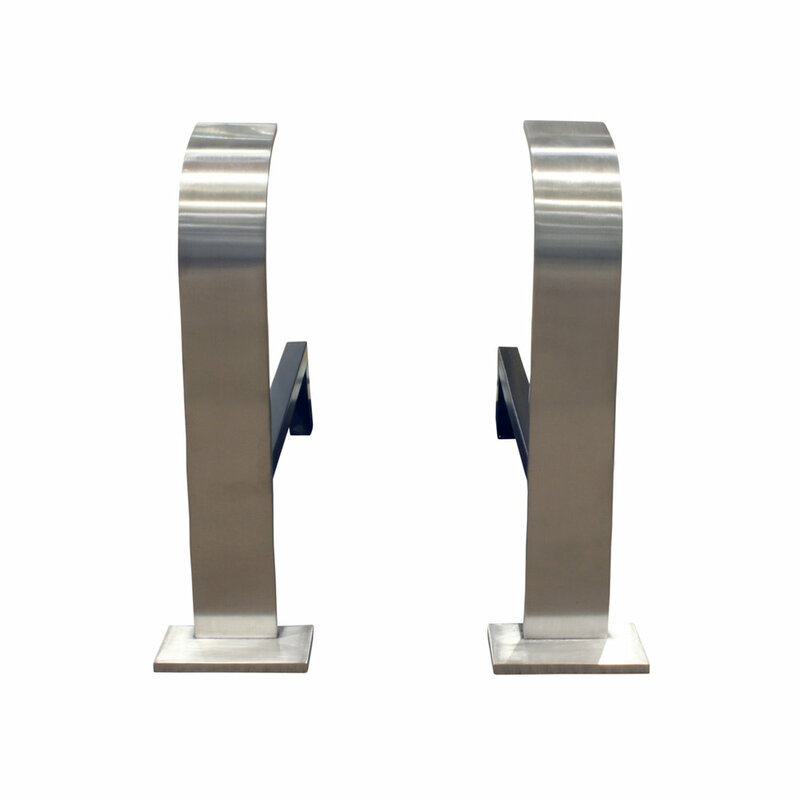 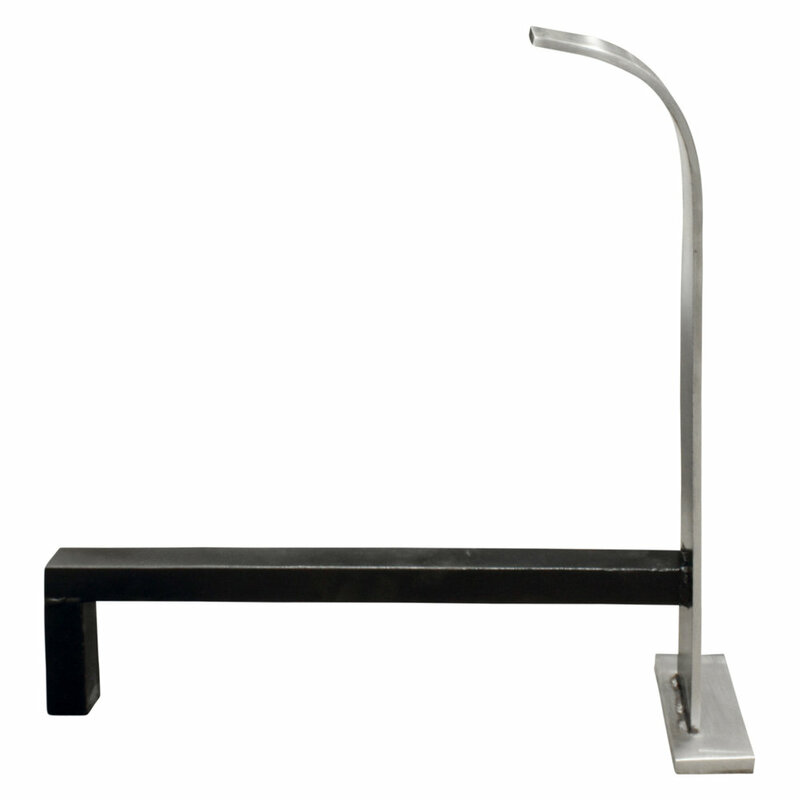 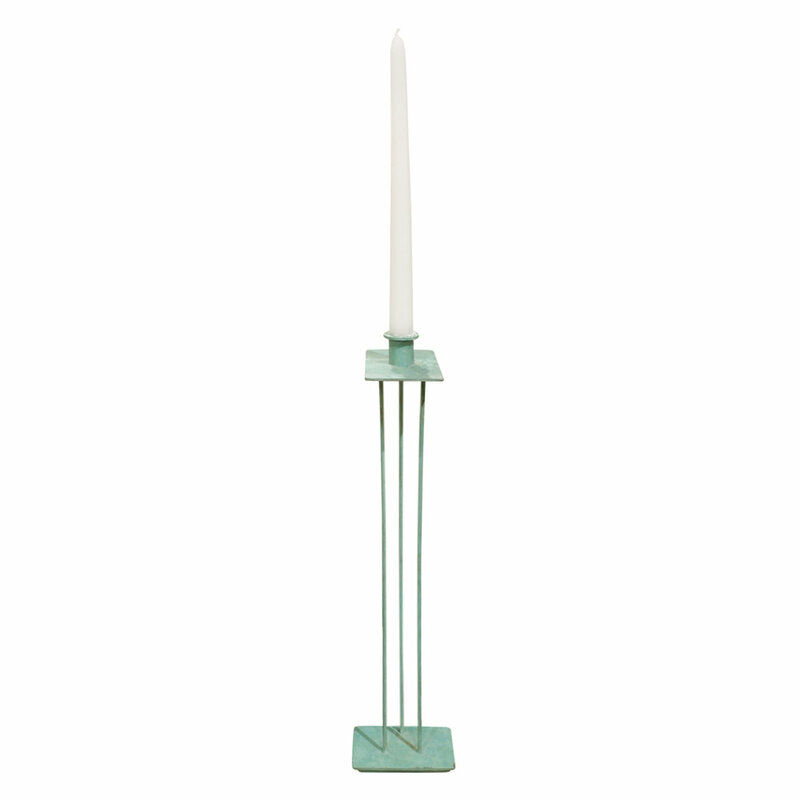 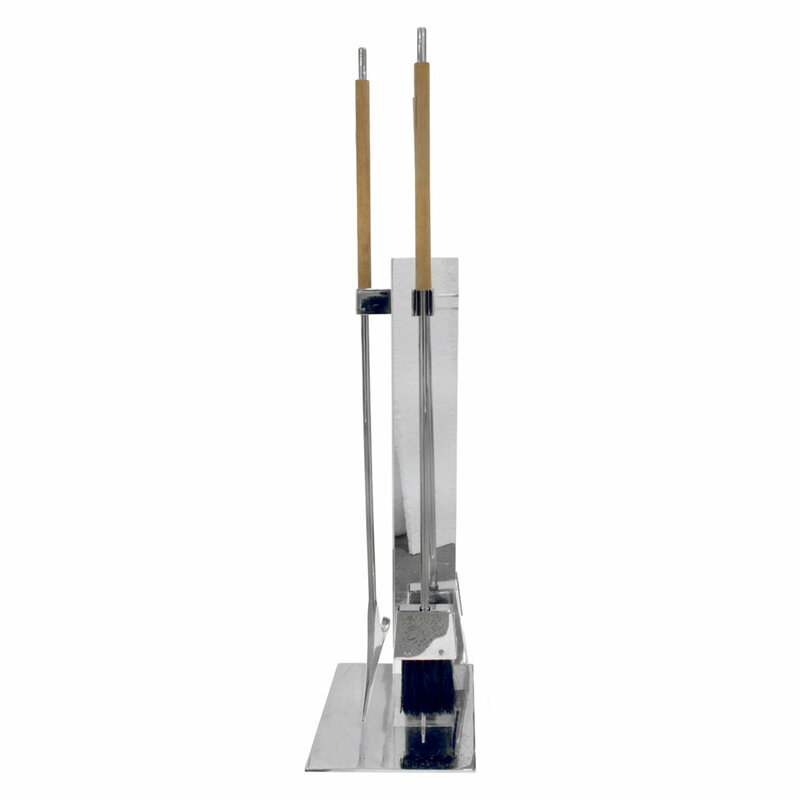 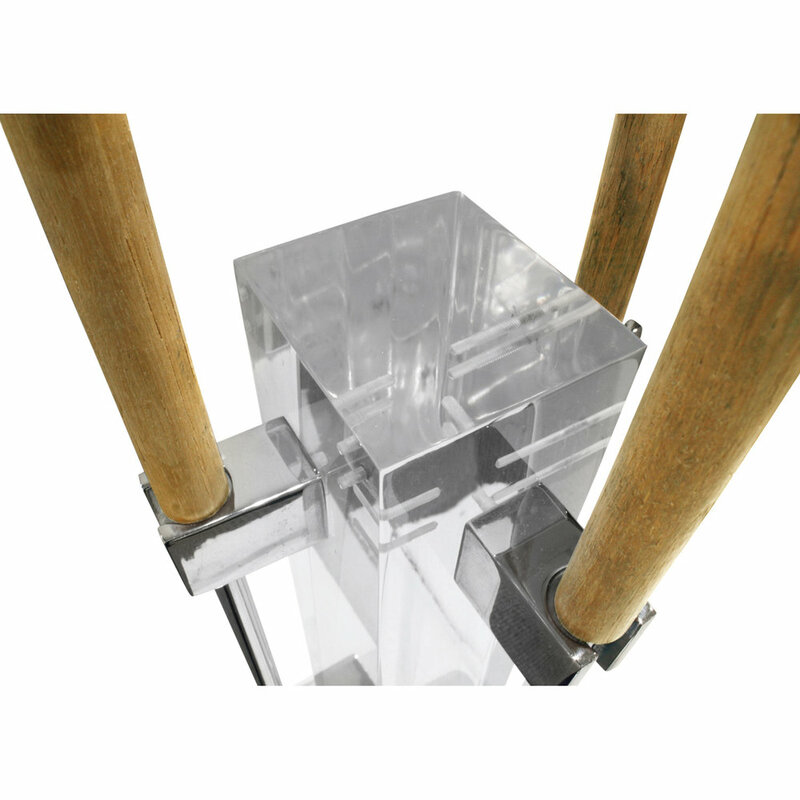 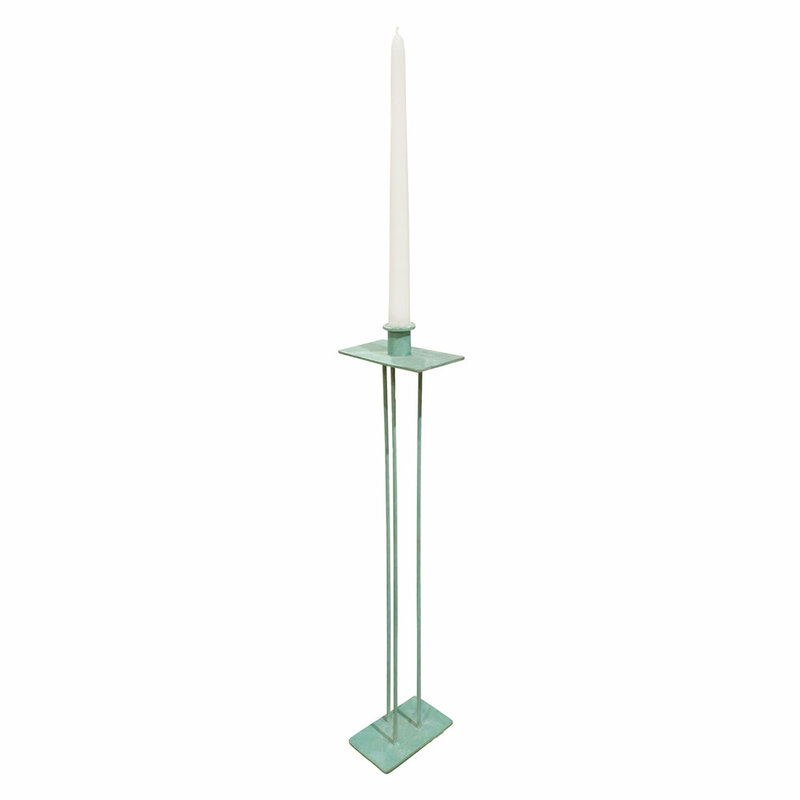 Set of fireplace tools in polished chrome with wooden handles on solid lucite post attributed to Alessandro Albrizzi, American 1970's.